My Children's Murder Mystery Party has generated a surprising amount of interest since I put it on the web early in 2007. Since then, over 5,000 people have have contacted me by email at thopk46@hotmail.com to request more easily editable versions of the materials (in Microsoft Word, Powerpoint and Excel formats), and I know the full set of PDF files has been downloaded even more frequently. I have included some citations from my email below. There are some older citations as well. I should add that I always seek permission from my email correspondents before adding their words or pictures to these pages. We had a great party and the girls enjoyed every moment. 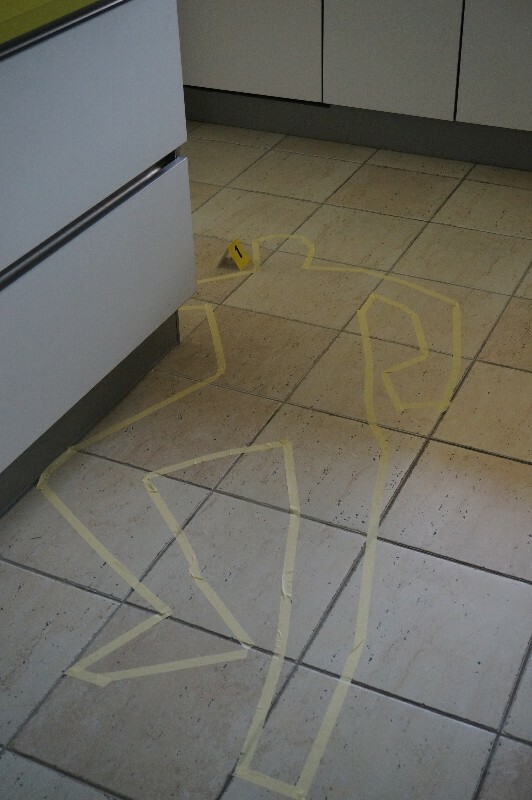 We added a crime scene and took something of every personality, laid it around the crime scene. E.g. camera bag for the photographer, an old book for the Antique seller etc. That gave a dramatic effect as there was evidence of every person there could have been the murderer. I laughed so much when they started accusing everyone. I wrote a letter from the "murderer" where she also send her chocolates which we laid at the crime scene...and only at the end did one girl start to suspect her, as there was no blood around the victim. 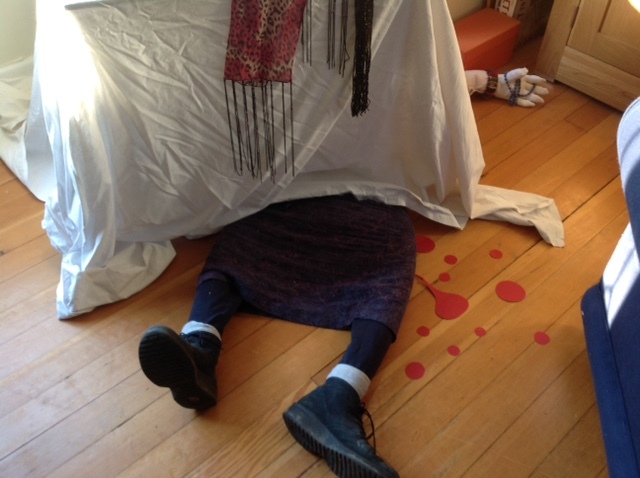 My daughter and her friends made the crime scene with a dead body (a stuffed bear, old clothes and stockings), and my younger daughter and her friend were a bit freaked out by it - which my older daughter enjoyed tremendously (sibling rivalry). We served Nachos as the supper...but they ate so quick to continue their investigations, not sure if they chewed the food. Overall we had such a great time - thank you so much. We’ve just had a fantastic time solving the mystery over dinner! All of the girls loved taking on the characters and as as the plot twisted we were all intrigued to find out who the murderer was! We can’t thank you enough for sharing this pack with us and helping to create such a lovely, enjoyable evening. Please feel free to use this as a review, I’ve attached a picture of all our colour coded envelopes! The guides would love to send you a thank you card if you have a postal address. I also slightly amended the format of the character sheets to include the name for the front of the envelope so everything (including the introduction, questions etc) could be printed onto one A4 sheet of coloured paper to save waste! If you’d like that document for future reference I’m happy to send it. Everyone dressed up and the level of enthusiasm and the amount of note taking was most impressive. Thank you so much for your generosity in making the materials available- I’ve made a donation to the Born Free foundation (the charity nominated by my daughter) and feel Ms Lovebug would approve! Please find attached a couple of pictures to give you a sense of the occasion. I hope the weather is nicer on your side of the pond today, we're looking at -13C and a big snow storm headed towards us in northern Vermont. I want to thank you again for making this party set-up readily available for us to use. We had a great time and it worked well with a mix of adults and children. I'm planning on throwing another one next year and will be working on some tweaks and enhancements to the script now that we have the general idea. I just wanted to drop you a quick note to say that we had great fun using the materials with the Scouts and Guides last night. We hadn’t told them in advance that we were going to be doing the Murder Mystery dinner, so it was a surprise to them when we announced it after lunch on Saturday. We had taken everyone a cheap white T-shirt that we’d bought in bulk, along with pens, fabric offcuts, glue etc. They then picked out an invite, which we’d tied in a tube with ribbon (colour coded for boys and girls) and they had to make their costume in preparation for the evening. We were really surprised how inventive they were, and they produced some really good costumes – many of which involved converting the T-shirts into something else, so for example the child who was the professor cut their T-shirt up to make a lab coat, and some of the girls glued bits on or cut frills into the fabric. 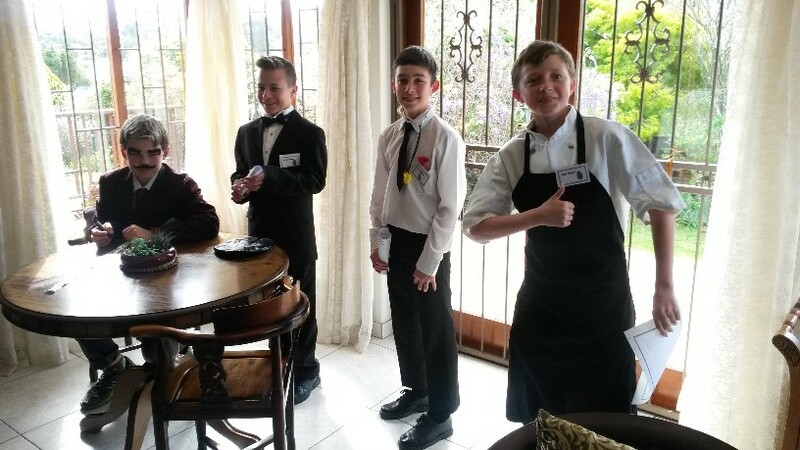 We then did a 5 course dinner (albeit that the courses were each quite small), and we had one of our Guide leaders lead through the script as Freddie and the children really got into the whole thing. My middle son was with us, and he was busy explaining the story to my wife this evening, so it had all clearly been taken in. Thank you very much for letting us use the materials, it certainly made for a memorable event. I wanted to let you know that I used the Lady Ivanda version for my party and it was a great success!! Thank you so much for helping me, especially at the last minute! I will keep the other suggestions for future parties. Everyone had a wonderful time and loved the idea so much that I had several ask me where I came up with it. I referred several to your website. Unfortunately, I didn't think to take any pictures until after everyone had left. There was a great amount of laughter and fun, thanks to your clever wit and plotting. Thank you so much for the scripts. We had the party and used Keith’s edit for 11 girls. They had such fun and really enjoyed the guessing game. I changed the confessions in order of their guessing who the murderer worked out ensuring I left the important ones to the end. What a fun party. Please forgive me for getting back to you so late. Life got busy after our party and as I was cleaning up my email I realized I never let you know about our party. 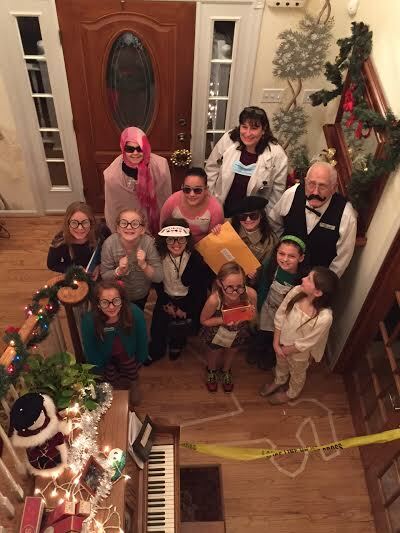 We did the murder mystery party for my daughter’s 10th birthday. It was a complete hit!!! Everyone came dressed as their character and acted their part perfectly. My daughter chose one mom to be involved and so I assigned her the role of the murderer/best friend. She was a riot! All of the girls said it was their favorite party. Thank you so very much for all of the time and effort you put into this party program. It was easy to follow and a great party. I’m attaching a few of our party pictures. Used the script for 12 for the [murder mystery party] this past weekend. Did a very rough version with our party who we went away with on the weekend and everyone enjoyed it. The kids loved to discuss different theories, speculate and it was fun. We did the mystery for 12 tonight! So fun! Thank you for sharing! Thank you again for sharing your materials with us. We adapted your shortest version, making it like a reader's theater. It was a lot of fun dressing and acting in character then fulfilling our parts in the script. 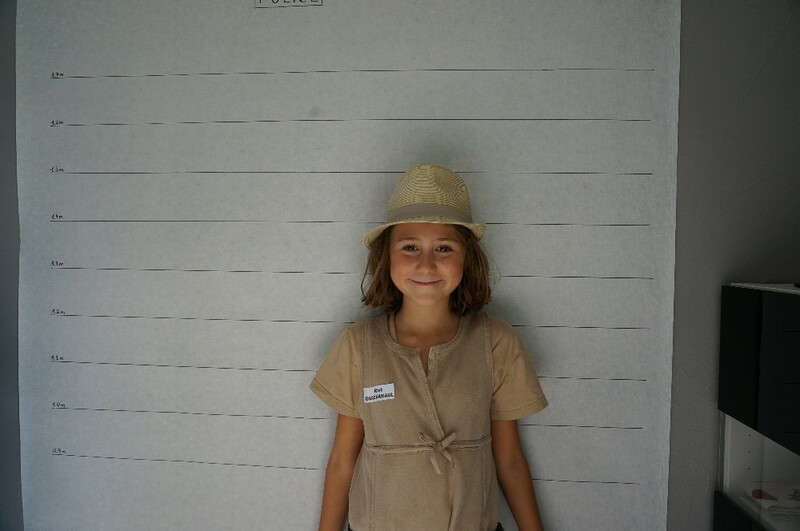 Everyone had a great time especial our little Nancy Drew! 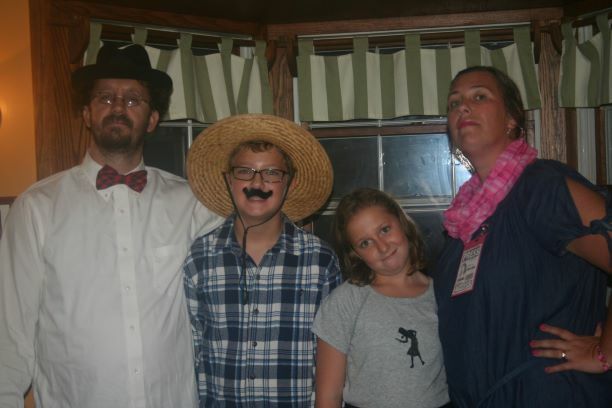 Here's a picture of our family in character for the party. I'll send you the specific adaptation I made for this group, maybe someone will be interested one day. Long life to your game all over the world! PS: following your recommendation, I've just sent a donation to SOS Villages d'Enfants, an lovely association dedicated to host brothers and sisters together when they're taken away from their parents (www.sosve.org). 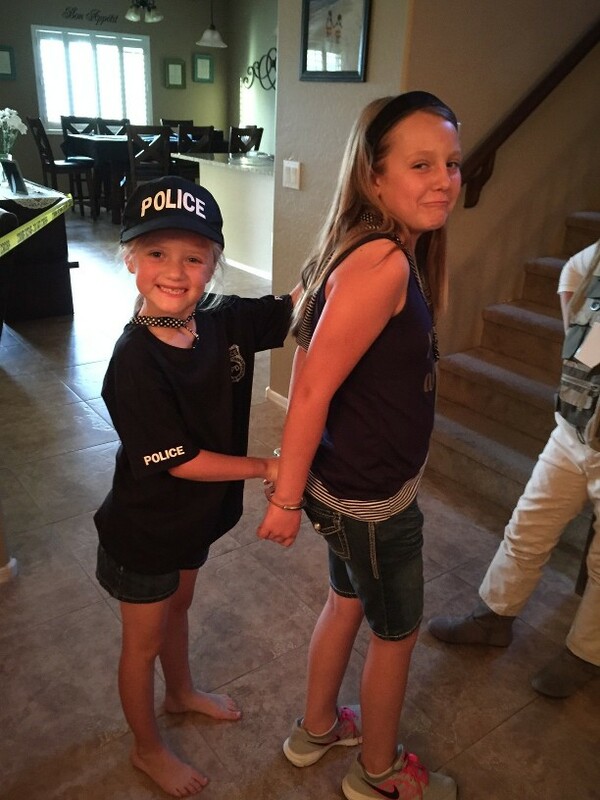 So we had the murder mystery birthday party for my daughter. In the end I rewrote everything to suit, but followed the general concept you and Keith laid out. 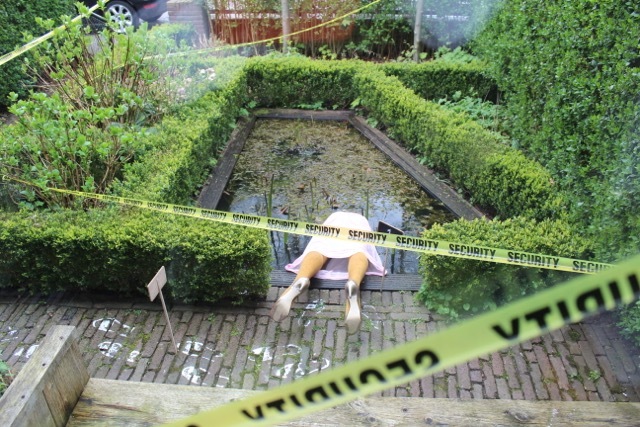 I included a few extra interactive elements - we had an heirloom to be destroyed as part of the instructions of the will reading (which was the 'artefact' the deceased always hated - and manifested as a pinata for us), a dead body on the lawn with some clues scattered about and referenced in the individual story lines and similar type stuff. 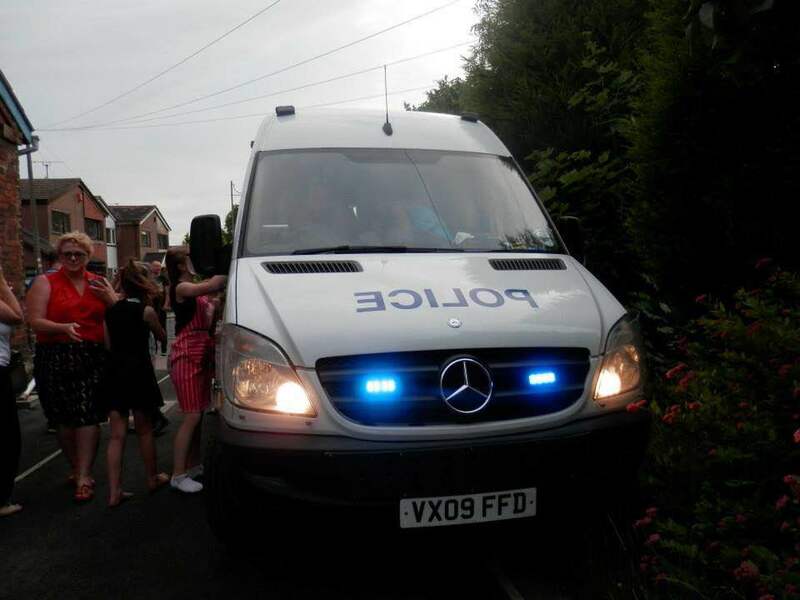 With more than a dozen 11 and 12 year old girls it was pure chaos and amazingly noisy, but they had a great time, so thanks so much for your help in making this a success for them all. 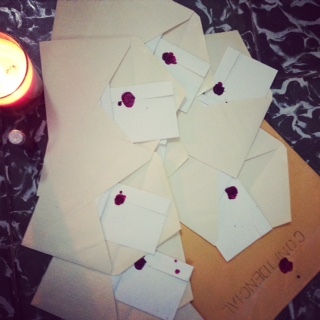 just a quick note to thank you again for the scenarios and ideas for the murder and mystery party! We had a great time, the girls loved it and were really into it with great costumes etc! I made some documents in French for a party of 10 girls based on the English version you had sent me for 11-12 girls. I’m giving them to you, maybe somebody would need them. The translation might not be perfect, but it worked fine for our party. 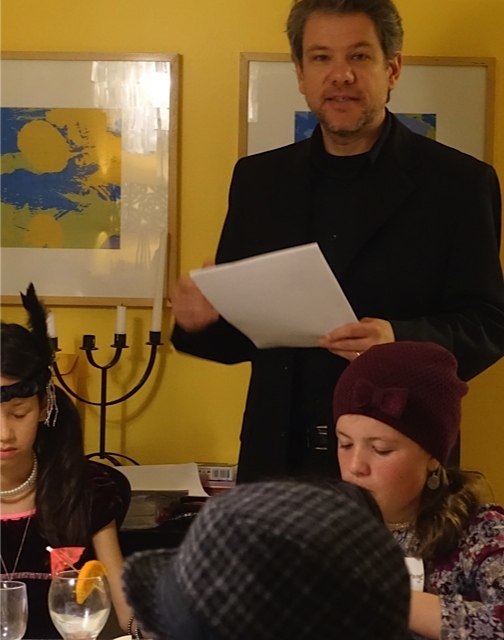 I just wanted to let you know that I hosted your murder mystery evening for my young nieces and nephew. It was brilliant and my own older kids had a great time too. Everyone got into their characters with amazing costumes. So I am now "fun aunty!" Thank you again for emailing me all the information everything worked really well, printing off. The party was a success! We ended up with 8 girls plus a few voluntold adults. The girls really got into their characters and costumes. I added a few extra rounds of clues and had them running all over the property to hunt for clues. Thank you so much for providing the material, I would have been lost getting anything started otherwise. Thank you very much for allowing us to use your materials. I edited it a bit to run more like a show than a party, and I had actors play all of the roles. Our event was excellent, and the guests loved the script. We went with the shorter one for 9 guests, and cut it down to 7. Murder mystery at the tiny castle was a great success! Used the new version for 12 guests. User-friendly to adjust, print and play. Enjoyed journey to event, evening itself and discussions after. Picture attached. Thanks so much! 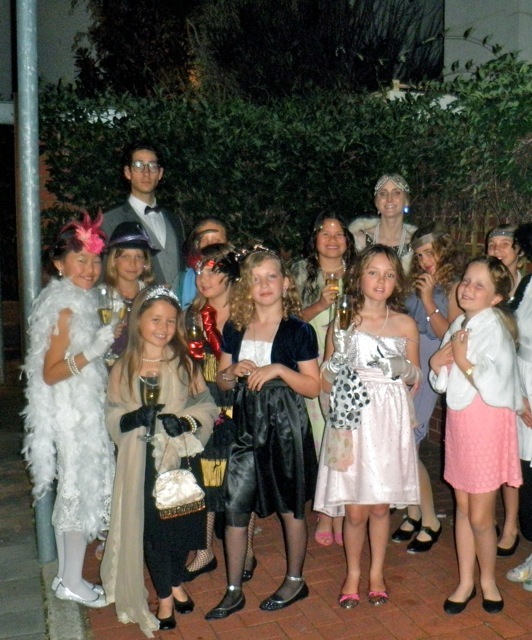 The party went really nicely - attached is a photo of our flappers and 20's party goers. Just to say we ran this with our Young People’s group and it was a good success. We used the Megan version and converted some of the characters gender. We also had to add a couple as well. We were fortunate to have plenty of hands to help which did make it a lot easier. Also the Young People really got into it which helped. They all turned up dressed for the part. Doing it with a Youth Group was a bit harder to control numbers. We did end up having to create a new character the day before and still had one turn up on the night which we had to blend in but we made it work. 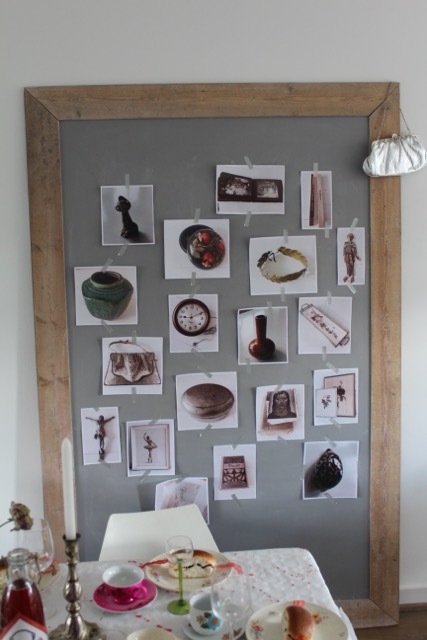 We also provided additional props which help a lot. It probably took about 90 minutes to run through. Given the storyline we thought it appropriate to finish with hot chocolate. I apologize for the long delay, but I just wanted to thank you again for sending me the files for the 11 girl book-themed mystery party. 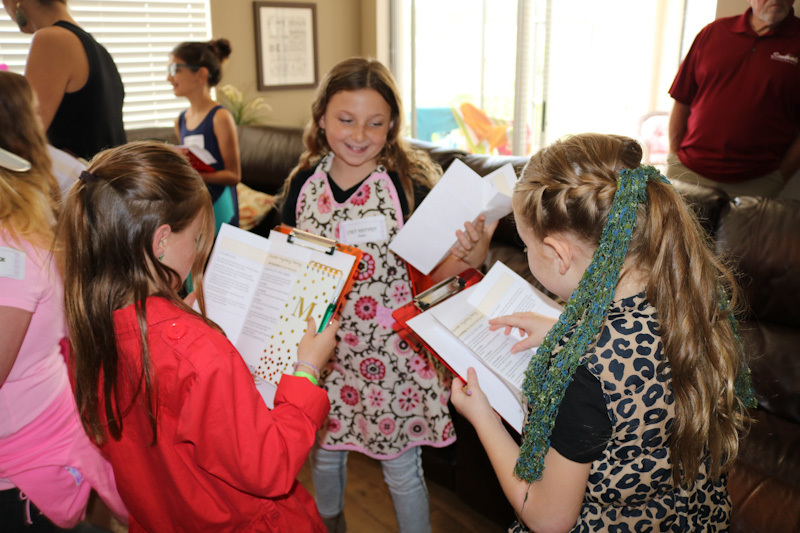 The girls worked through the mystery as part of the Girl Scouts of the USA Junior level Detective badge. Because you were so quick in replying to my request for the materials, we were able to assign each girl their character at our prior meeting (I just cut the brief descriptions up and had each girl pick out of a bowl). 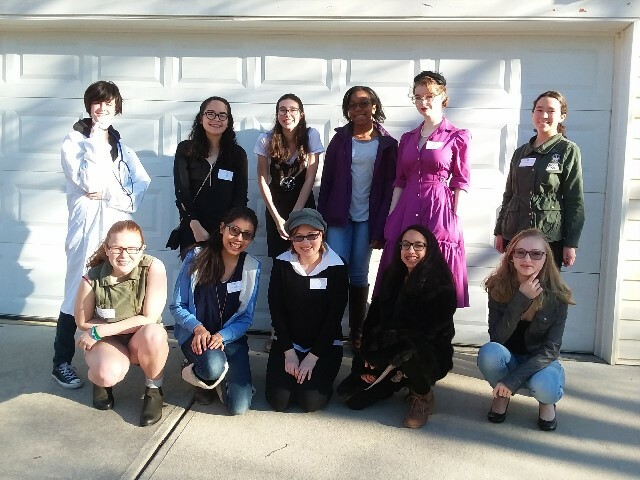 We reminded the parents and posted the character/cast list a few days before the meeting with the instructions that the girls could dress up or bring any kind of prop that related to their character. As you described on your website, the girls arrived at the meeting already announcing their character to one another. Several girls brought props and I was sure to have a little something for everyone else just in case. We actually had 2 girls sick that day, so myself and another troop leader had to assume a couple of the roles (which actually turned out to be a lot of fun). Before we started, I told the girls that we only knew a small portion of their character’s back story and told them to be inventive—have a fun accent, a weird tick, anything that they could think of that may bring their character to life. We gathered around in a big circle and went through our introductions, mingled around our meeting space so that everyone could talk with their assigned characters, took a few moments to ourselves to look over our clues, and then reconvened to go over our evidence and reveal our secrets. Our girls can have a difficult time staying on task, paying proper respect/attention when others are trying to speak etc--I was honestly worried that this meeting would be a disaster. To my delight, however, the girls have rarely been so attentive and well-behaved as they were while playing the mystery game. Some of our more shy girls even shocked us all, adopting wild accents and bold personalities for the duration of the event. The girls could not wait to hear the next secret that would be revealed and they all had a really fun afternoon. I think it was one of my favorite meeting that we have ever had! 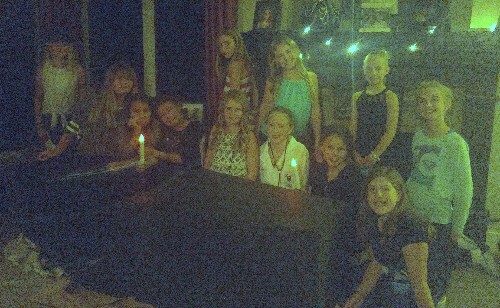 My Girl Scout troop thoroughly enjoyed the mystery game. I took care to create a special envelope for each girl with a name tag, introduction, and questions. Later I distributed the secrets, then lastly the confessions. Everyone had a blast and only one person accurately guessed whom it was. I had to reduce the game down to 8 but managed by cutting and pasting. If you are interested in having an eight-player version I can always give it to you. This is to thank you once again for the mystery party scripts! I kept the lawyer's part (as recommended) and facilitated the whole event, while "representing" of the other suspects' roles (the hairdresser's) on behalf of one of the invitees who did come. The info sharing among the girls picked up more interest when I asked them to share their secrets with the group...there was a lot of interaction with suspicions and accusations then! Just one of the participants got to the right conclusion about the mystery murder, whereas some accused multiple people as being part of a group of murderers! The girls who were acting out more vividly, also got a lot of votes as potential "murderers". All that made the whole thing a lot more "mysterious" and kept their interest for longer. Combined with soft drinks/snacks and dinner, I would say that it took between 2-2.5 hours for the mystery theme to complete, which is a good timings either for a normal party or for a slightly longer one (including other activities too), like ours. Finally, I was wondering if you have also different themes for children's/teenager's parties and -maybe- something for adults? Thank you once again for sharing this wonderful idea and work with us! 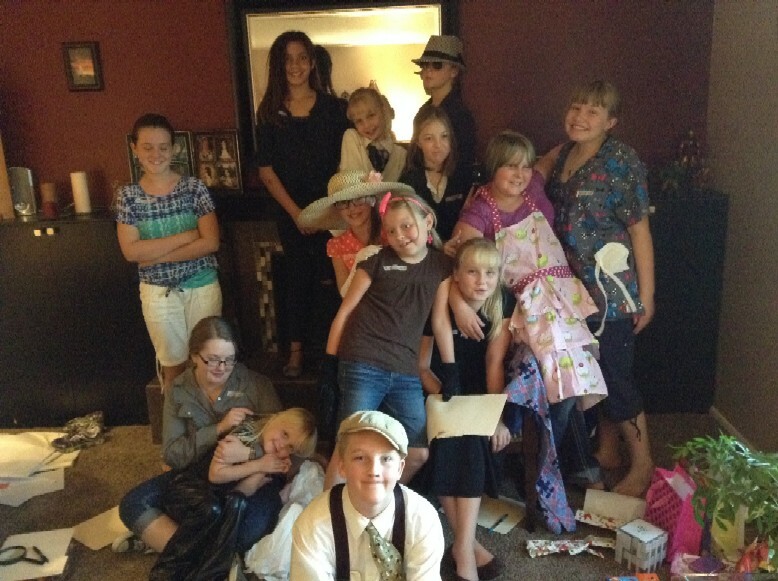 We had the murder mystery party for our 11 year old tonight. We used the 12 girl version. It was awesome! The girls had so much fun! We changed it up a little bit. We did the intro, then they asked their questions over dinner, then I read the entire will, then they all said who they thought did it. Then we read the first 9 confessions. Then out of the remaining 3 I took a vote on who they thought it was. Then they read the remaining 3 confessions. 2 girls guessed who the murderer was correctly. They had a great time! Thank you for supplying the mystery! Thank you for the information for the birthday party. It was a great success and the kids loved dressing up and had so much fun. I think 11-12 year old girls is the perfect age for this game! I translated and changed the game slightly to make it suitable for Afrikaans children. Although one can use girls and or boys by just changing the titles, we were 11 girls. I would love to know if ever someone in South Africa is able to use this. Just a quick update that we did the party! I had a crew of super smart and well-read teens. We kinda whizzed through the murder mystery in a little over an hour. 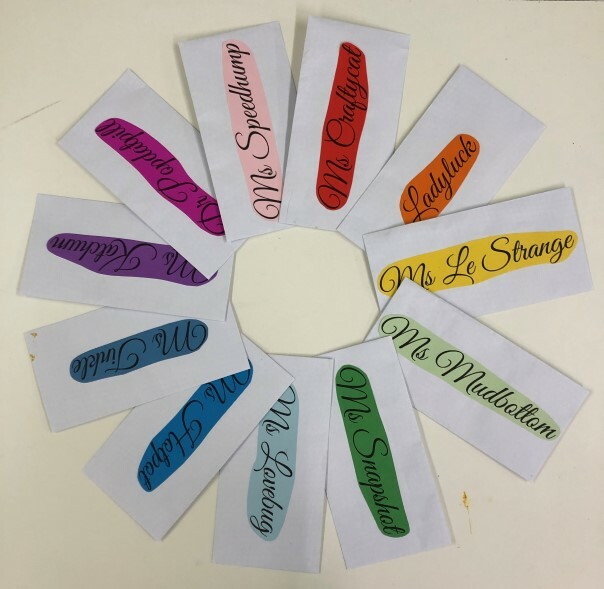 I had added some details about a dinner the night of the Baroness' demise...with some extra clues. We almost had to create an extra character - the hair dresser - who would have thrown a few more clues about the Baroness' thoughts on faking her death...but we ended up the 12 instead of 13. We had fun changing some of the names. Here's all our updated/edited copies. Everyone had a good time and really enjoyed themselves. Thank you for sharing this plan with us! 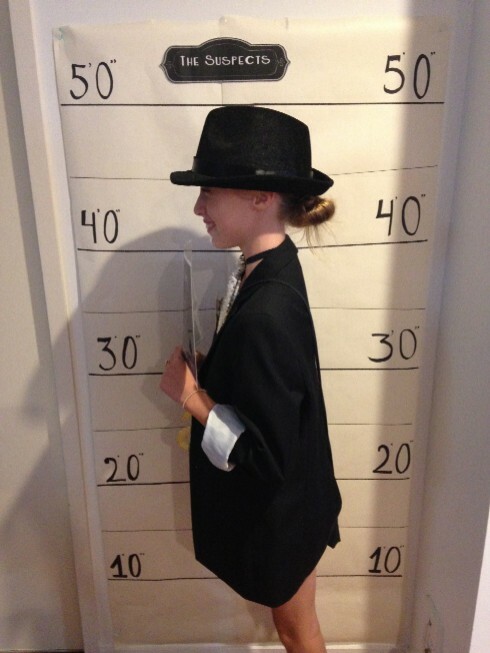 We had the best night ever at Noah’s 1930’s murder mystery Oscars party! The information you sent me saved the day as I had never done one before and the original packet I ordered never did arrive - although I did get my money refunded. Thanks so much. I have donated £25 to the parent council at Noah’s school which will go towards play/sports equipment for the children. Morning Trevor, Just wanted to say thank you for sending the murder mystery links to me. We did use it back in November for my daughter's 12th birthday. It took a bit of editing to make it workable for a group of 11 and 12 year olds. That said they all enjoyed the party and I promised to donate to charity if we used the information, so just really letting you know we donated £25 to Save The Children on 21st December. A little late to let you know but only just catching up after the Christmas and New Year festivities. 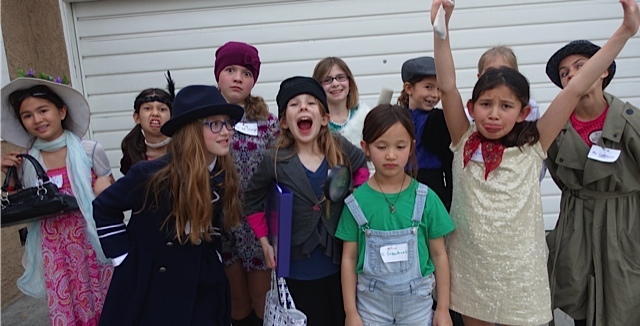 Just a quick note to let you know that our Murder Mystery party with the girls in our Girl Scout Troop went beautifully. Fun was had by all. Thank you again for sharing this on your website. The girls want to do it again....though I don't know how they can be surprised at the ending the second time (LOL). Many blessings for a healthy, happy and prosperous New Year for you and your family. 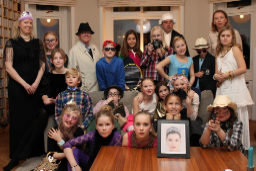 I wanted to thank you for the information and links for the Murder Mystery party. Our library had 16 teenagers sign up for the event so I wound up using the one for 18 mixed-gender guests. The kids loved it and had such a great time! I brought in a huge box of props and it was so much fun watching them choose what to wear and get into their characters. The event was a huge success! Thank you for your generosity in sharing your party! 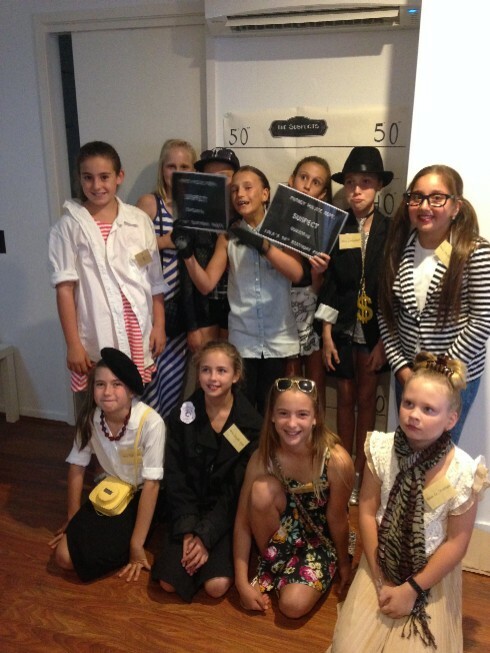 Hi Trevor, I finally ran the murder mystery party for my daughter today, using the set for 11 girls. It was a great success and the girls had a fun time. Thank you for sharing your materials with me - I have a very happy daughter. Thank you for sharing all of this information and so sorry it has taken me this long to let you know how it went. We had a very quick version, but everyone seemed to really enjoy themselves. I had to edit it a bit to make it more “adult-friendly” and added a couple of “husbands” to the female characters, or change the females to males to get all my team involved. But it was so easy to do and so helpful that I didn’t have to start from scratch. Attached is a photo collage of our Halloween celebration to show some of our characters. 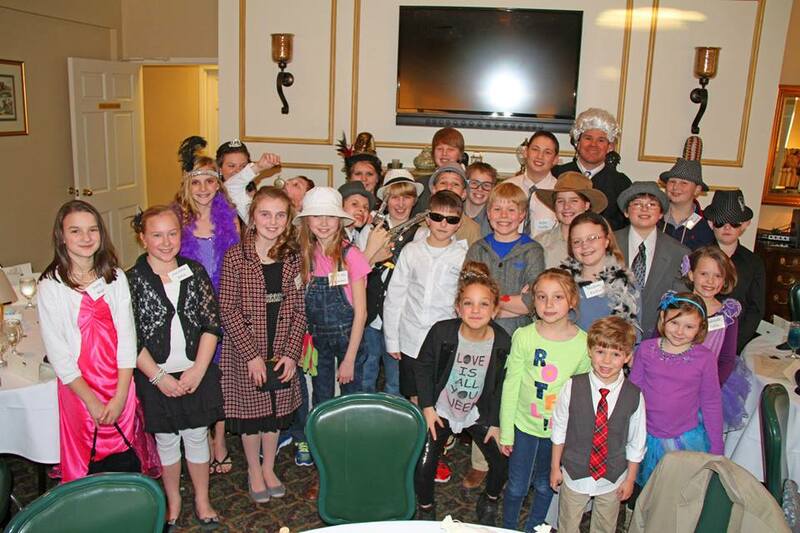 Wanted you to know we had a wonderful time last Saturday evening, Oct. 28 with our Mystery Party where we "solved" the mystery of Baroness Arabella WORTHINGTON. Yes, I took the liberty to Americanize some of the names and relate the names more to their occupation so we could remember who the characters were! Our police chief was Everett "Evi" Dents, our coroner was Dr. Izzy Dedjet, and the postmaster and his clerk were Del and Dee Livery. Even with your funny script to base it all on, it was a lot more work than I first thought - to organize all the invitations and plot script - so I was thankful that you had done the bulk of it for us. 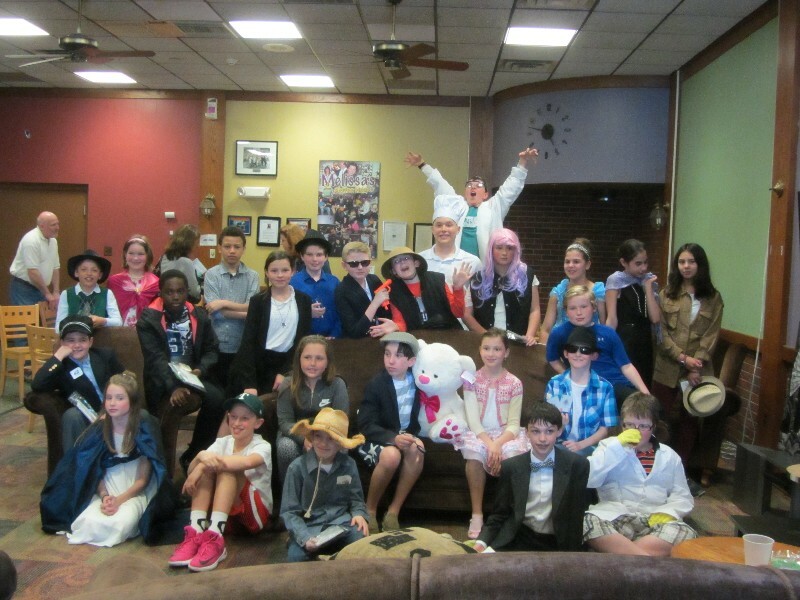 Everyone had a great time dressing up for their part and it all came together beautifully in the end. 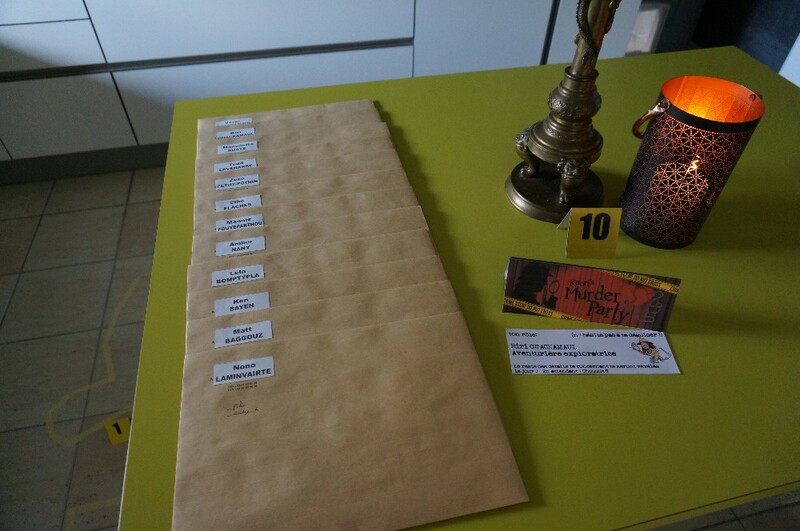 We managed to get spots for 38 characters, 10 inspectors (who each read part of the Freddy questions) and 10 jury members, so we were able to accommodate over 50 people at our party. Again, thank you for the original idea and for sharing your work so we could enjoy it, too. We had a donation kitty instead of selling tickets - so our Food Pantry and Historical Society shared over $300 that was donated for the evening of community fun. Thought I’d let you know a variation that we did based on Angela’s version. We told the girls to read their introductions and the mull about asking their questions, however they each had a secret already listed on the page. Each girl had to reveal the secret to one other person and eventually ask if they heard anything interesting or unusual at the party. This seemed to encourage a lot of talking, fabulous theories and much intrigue. It was also a good lesson on gossip and how stories can be misinterpreted. The excitement was just buzzing about the house. The party was a huge success on Friday, October 13th! Thanks for the fun! 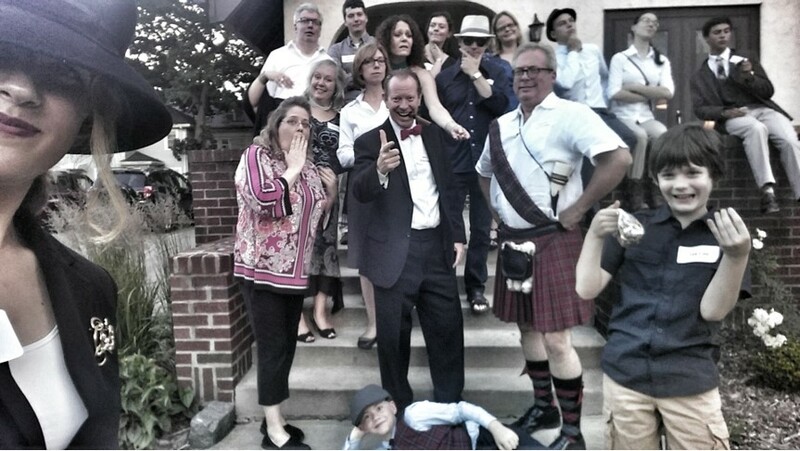 We recently had another Murder Mystery party. There were 23 kids in attendance and they all had a great time! A few of the character description were changed. The poker player was changed to a professional UNO card player. You can see his hat and shirt in the picture. Thanks again for letting us use your script. Thank you again for your materials! The party took place last Sunday and it was a great adventure. My daughter and her friends have loved it very very much. About a year ago you sent me your Murder Mystery script. We finally had the party. Thank you so much! 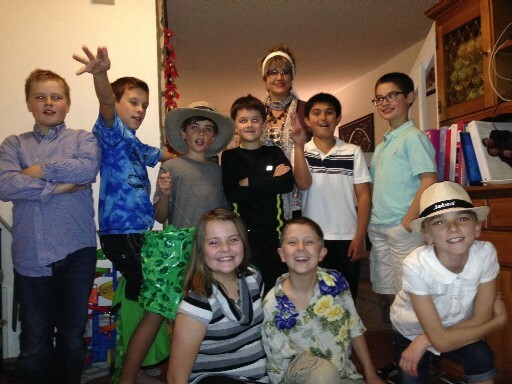 I had the party for our local homeschool group, and the kids had a blast. They all came dressed in character and enjoyed calling each other by their character names for months afterward. Unfortunately, since I was running the party I didn't get a lot of pictures. I've attached two of the best ones. I have another group of homeschoolers that would like to also do the party. This group is smaller. I was wondering if you could possibly send me your script for 18 mixed genders from the Poole Family. I just wanted to let you know that the party was awesome!!! Thank you so much for the very easy break down on how to put it all together...it was so much fun!!!! I finally had a moment to look at your site and all of the citations....this is just wonderful that you do this! I have had quite a few friends ask about it since. Our girls and their friends still talk about it...it was a huge hit!!!! I see that some people added pictures so I thought I would too. As we didn’t know how Ivanda was murdered we decided to have the “wake” at the time of the reading of the Will. My daughter really wanted a dead body somewhere but that would give away how she was murdered or it wouldn’t be the right way she died in the end so we thought this was a better route. My husband made a coffin the day of the party....it was a huge hit! Thank you for all the party selections. 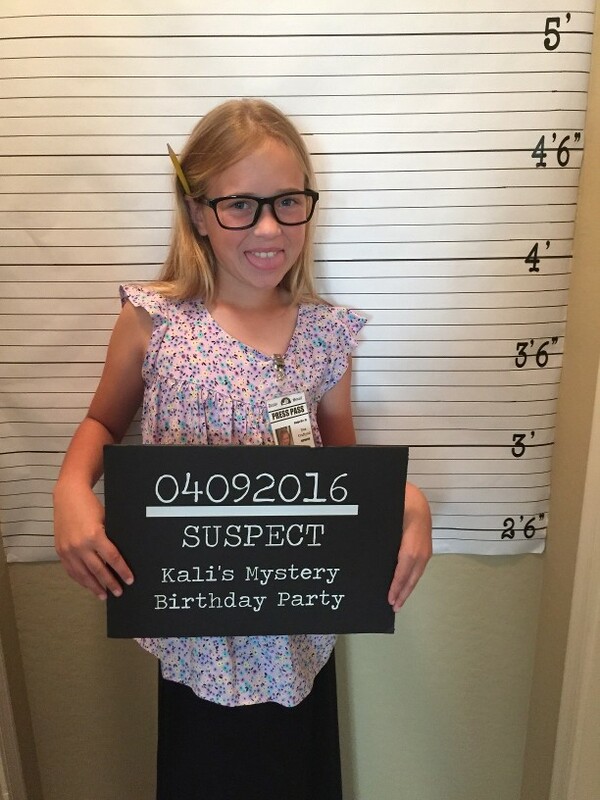 We finally did do the 28 guest mystery party, but modified it to 20 guests; albeit 2 years later, for my second daughter’s 11 year old party. She has a more extrovert selection of friends who I suspected would be eager to throw themselves into their characters. As it turned out, one of her friends had a grandfather as a race car driver – so she had a full fitting race suit! My eldest daughter and her friend are now in high school – so as Headmaster – she wore their school blazer. And her best friend did a very good Holly Golightly impression to be the New York Socialite Clarissa Bradshaw. It was a lot of fun, and have had lots of compliments – thank you. I have also had a few enquiries – for whom I have directed to your website, for anyone to contact you directly. PS. Donation made to Surf Lifesaving Australia. 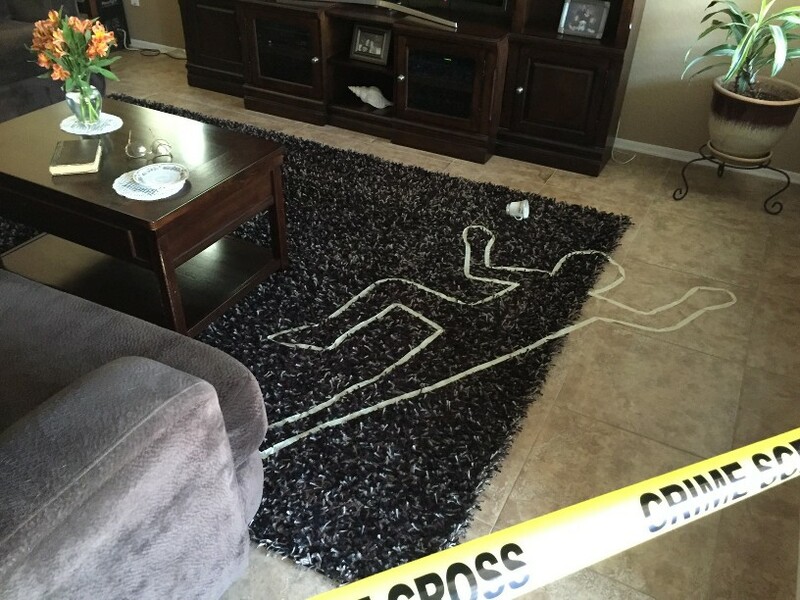 I just wanted to let you know that I used your Murder Mystery instructions and it went really well. It was with a group of adults with physical and cognitive disabilities so I had to modify it but it was great having all the materials. Thanks again! The Murder Mystery Dinner night was great! Everyone arrived dressed up and eager to play their part. I ended up using the 28 guest script but made several alterations to fit the number of guests and the difficulty of the mystery. I handed out their scripts as they arrived. I decided to make one of the guests the murderer. So I slipped a note into her script letting her know and warning her to keep it a secret. After everyone had said their lines, I gave the guests three chances to guess and vote on who the murderer was. They revealed the murderer on the second vote but it took them some time to talk it over and debate. My mother helped cook a marvelous meal as well. Afterwards, the guests mingled and left as they pleased. It was a wonderful night and they all enjoyed it very much! They are already talking about holding more nights just like it with new mysteries. I cannot thank you enough for the fantastic script and materials! Here is a picture of the gang. It was a success! The murderer was discovered by the birthday girl! The only suggestion I have for the one for 12 girls is this: the instructions should specify that the adult coordinator needs to ask the characters specific questions to reveal some/all of the secrets after the reading of the will. Thank you so much for your generosity. I have attached a photo of the girls and of the table for you to post on your website. We doubled up, two girls per character. (24 girls to 12 roles). Worked quite well as they could discuss their clues in pairs and speculate as to who the murderer might be. Only challenge was that they had to share the reading of the intro’s and confessions. But at least everyone felt involved. A little noisy at times, keeping 24 kids focussed and listening to each other. And of course, some read more fluently than others. So as facilitators we had to ensure key themes came through. All in all, I think the girls had a great time. (Can’t say the same would have worked for 24 boys!!) 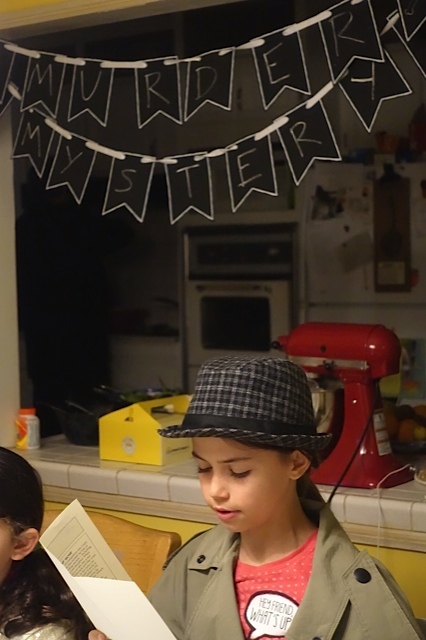 Importantly, my daughter was very happy with the outcome of her murder mystery party. Many thanks. We will make a donation to a favourite charity in due course and advise you. We simplified the wording of the will slightly, so as not to lose the 12 year olds. Next time I try this, I’ll try be more organised and send out invitations in advance, allowing the kids to dress up in character! As we hadn’t given the girls an opportunity to dress to character, we suggested they might like to adopt an accent for their characters (as some were British or American) but this tended to make it more difficult for people to follow what they were saying. Its important for everyone to hear what is being read out (introductions, confessions etc) to piece clies together. (It may even be worth encouraging the girls to read slowly and clearly). 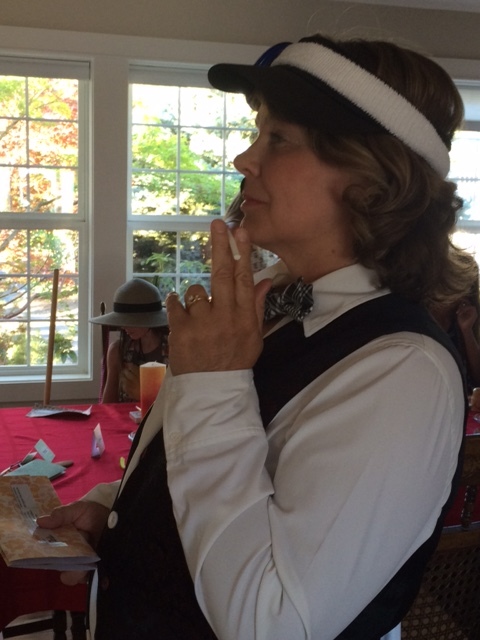 My son’s Murder Mystery party was held this past Saturday and was a great success! We had 25 kids and no one figured it out until the end. I am sending you a photo of all the characters together as well as a photo of all the items we collected that will be donated to a local charity that helps newly arrived refugees. Again, what a gift you have given parents and the kids by making this available to use. THANK YOU so much – the spirit of Ian Beasts lives on!!! Thank you so much for your quick reply to my email inquiry. I used the mystery game for the 10 girls and it was a complete success! You really saved me and the birthday girl's anxiety was put to rest. I have made a donation to the Hope Center for Kids here in Omaha Nebraska, as a thank you for your generosity. Thanks again! Blessings, Christin. We had kids as young as 5 and as old as 10 and it engaged them all equally. It was great to get lots of different guesses as to the culprit too - thanks to your script writing skills! All the best with your work going forward. And thanks again for sharing - and for saving me a whole heap of work! PS A couple of pics: Mr Hotpot and Ms Snapshot!! 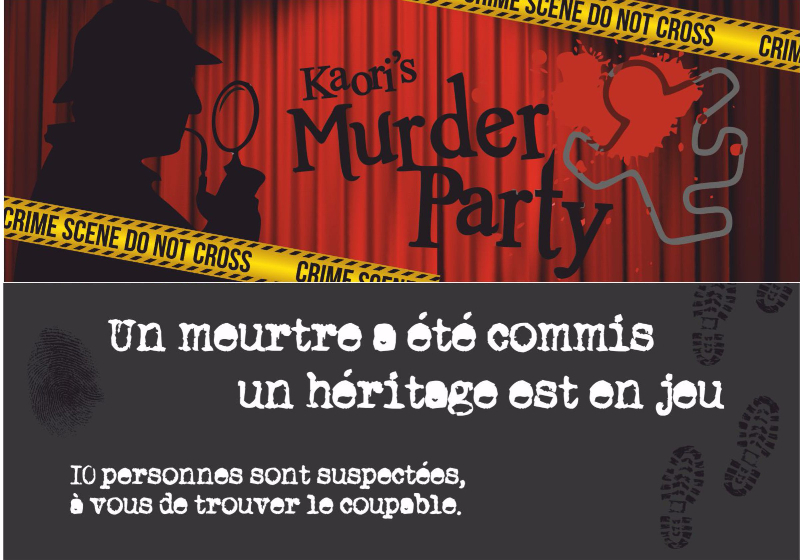 Thank you again for sharing the Murder Mystery Party materials. We used Beth's version. It was perfect! My daughter, Jane, and her friends enjoyed the party as did I. In the the spirit of "pay it forward", a donation was made to the Snack Pack Mission, which provides food to underprivileged children in our local schools. Thank you for sending me the editable versions! The party was a major success! Majority of the guests where between the ages of 14-16 so I adjusted the storyline ever so slightly to suit. Everyone enjoyed themselves and had an amazing time. They found the plot very intricate and engaging, with many twists and turns that they were not expecting! They also loved the questions and found this very interactive and fun. My family and I live in Atlanta, Georgia, and we just celebrated our daughter's 9th mystery birthday party (based on the Poole family's version). It was a resounding success!! 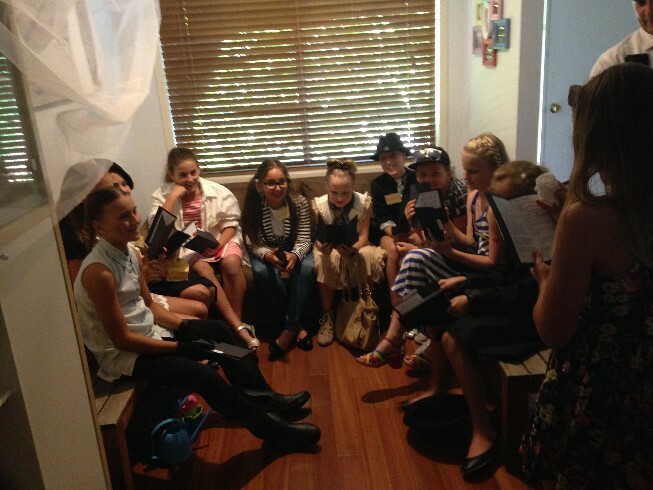 We had boys and girls ages 7-14 and almost everyone got dressed up and everyone really got into the story! In preparation, I wasn't sure if they would be able to follow and "get" the plot but they seemed to do fine. I did have to change a few of the names and details to make it more American but they were minor changes and on the whole, I was able to use almost all of the work that had already been done! I did read through all of the script a few times before the party to get an idea of the story and made a little cheat sheet to help me keep things organized in my mind and also to help with the flow of the party. In the middle of the party, after they had milled about asking questions, we took time to have a "mystery dinner". 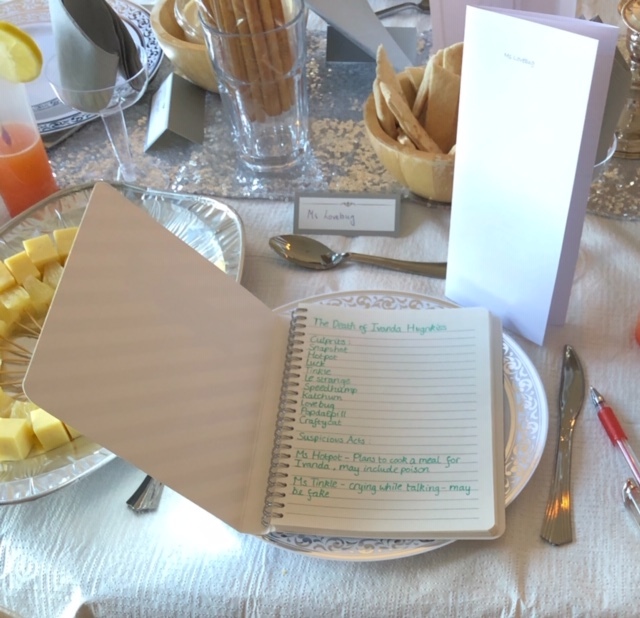 Each guest was given a menu with numbered items. There were 3 courses to be filled in with 5 items in each course. Some of the items were named things like "gardener's helper" and it turned out to be gummy worms. Another was "cat's eye" and that was stuffed olives. "Boxer's Best" was punch to drink, "The Scoop"- spoon, "Wicked Chick"- deviled eggs, "Three Little Pigs"- sausages, "Elephant's Wage" was peanuts, and so on. 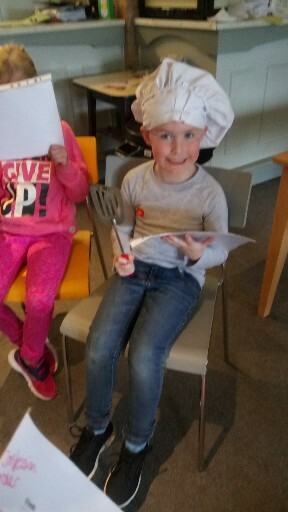 After the menus were filled in, the children took them to the kitchen where some parents filled their plates one course at a time (they would return for each course). It was really funny to watch the kids trying to figure out what each thing was and sometimes hilarious to watch them eat without any utensils if that had not been part of their order. The whole party took about 3 hours but that included the dinner and opening presents at the end. Thank you again so much for sharing all of the information with us!!! 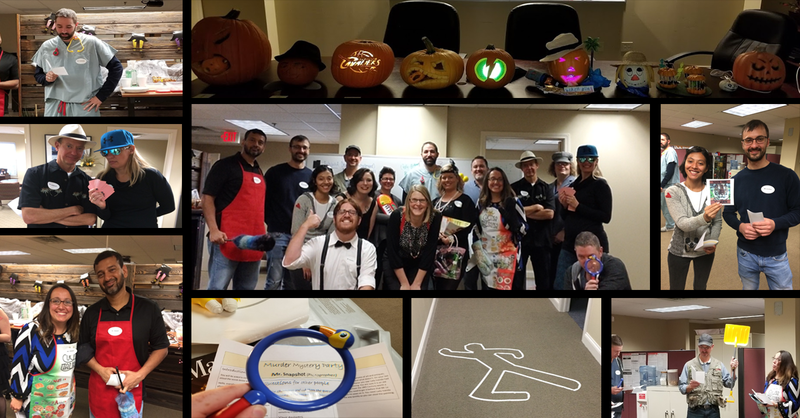 On behalf of the Lansing Community College Sign Language Club in Michigan, USA, I want to thank you for sharing the details of your murder mystery party with us. We hosted the full version of your soirée last Friday and it was a huge hit. Freshmen in the program were so engaged in the game that they came out of their shells and used sign language to dive into the colorful characters and world you created. 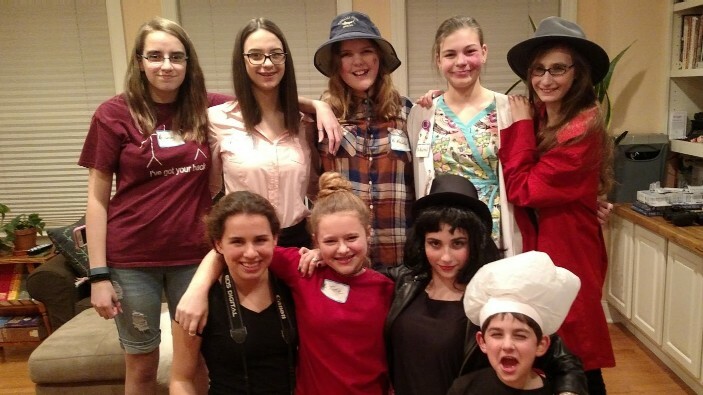 In addition, many expressed that the murder mystery was their favorite Sign Language Club event to date. I have to say I felt the same! 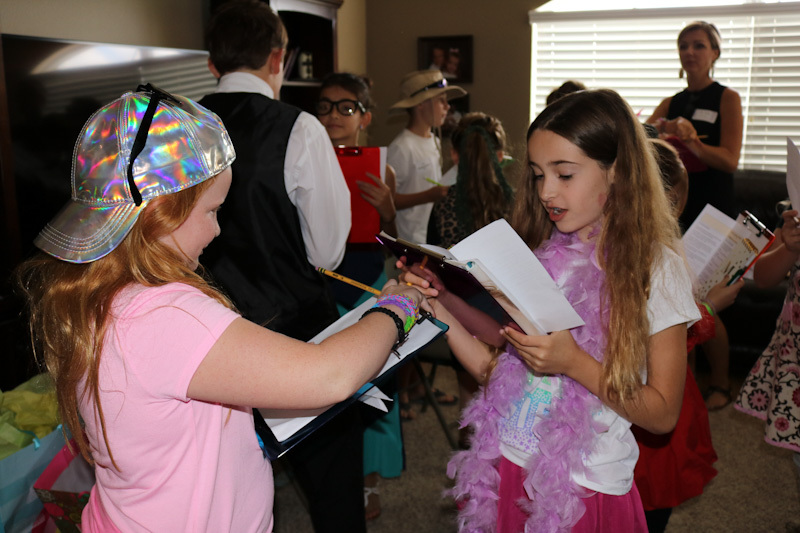 Wanted to let you know that your scripts were great... We modified character descriptions slightly to fit the girls attending, but otherwise, what you provided laid out the entire mystery and made it all very easy. The girls had a great time - and by asking for donations rather than gifts my daughter actually raised more than $600 dollars for the animal rescue group she selected! Thanks! We used Beth’s version last weekend and the girls had a fabulous time! There were great costumes and lots of laughter. The girls decided that we would send the donations to our region’s children’s hospital, IWK, where several of the girls have received help. Hello again Trevor, it has taking me some time to find the moment, but I haven't forgotton to send you my Spanish version. The party was held in January and it was a success. It led to great expectations, as it is not a popular thing to do here, so everybody was very excited and expectant with the idea. The party itself was a success: we all had fun, and everybody said her part of the script and had her minute of glory. All of the parents were eager to know who the murderer was, and really aprecciated the effort. But, furthermore, my daughter and we, all of the family, had a great time and really enjoyed the plot. I have taken away all surnames (real ones I mean), so that you can freely give it away unpersonalized. Main features of my version: Instead of a hippo, there is a turtle. All of the guests were girls, so I adapted all characters to them. I teach english and have an academy, so I held the party there and afterwards, we had some pizza. Thank you so much for sharing your Murder Mystery with me. 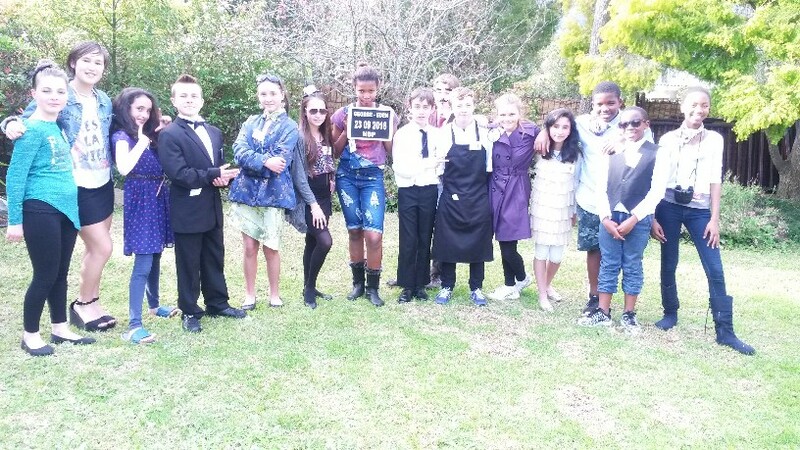 My forensics class did a “murder mystery breakfast” in which everyone brought in their breakfast food and dressed up as their character, and it was so much fun! We used the Noble family version, and it was so great. The male:female ratio was perfect, and all the characters roles were so well thought out. The only twist I put on it was that I didn’t have Jules Bond read his confession at the end. Instead, I had the class predict who they though was the “murderer” at the end. 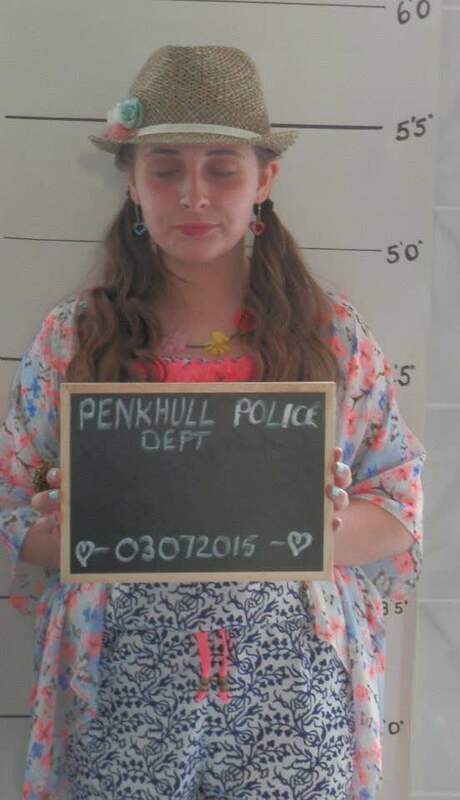 They really had their eye on Mrs. Hotpot and Dr. Popdatpill, but in the end they convicted Ms. Tin-kel. So next day we did a mock trial for Ms. Tin-kel in which Ms. Craftycat was used as a witness, and so in the end the jury found her innocent and cleared her of all charges. I can’t wait to try this again next year! I used the girls variant with a girl scout troop of 9-10 year olds. They had a great time. I put all the parts in a hat and gave them out randomly then gave the girls 5-10 minutes to read everything, think about their character, and get ready. Then we did the introductory speech and had everyone go around and introduce themselves. By about halfway through introductions girls were hamming them up quite a bit and having a lot of fun with it. 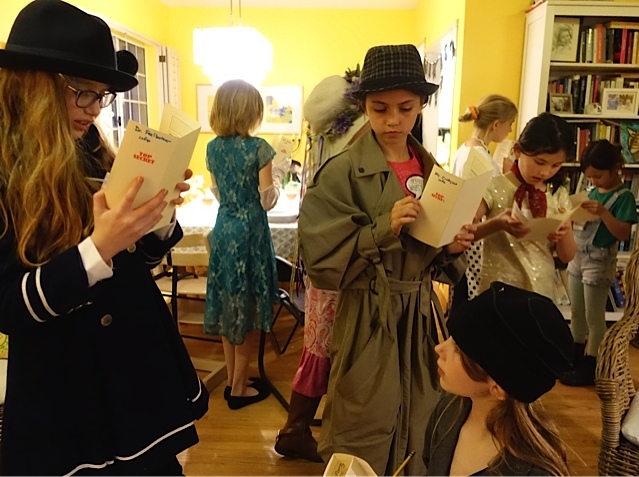 We broke for refreshments before we read the will and let the girls interrogate each other, which they approached with gusto, staying in character and adding theatrics at key moments. By the time we started getting to confessions they were accusing each other and lost in the game. I would shout "Confess!" at girls and they would read their confession (I knew who had the killer and had a good idea of what order they should go in, it took a little management but it was easy enough). By the final three it was bedlam, and the reveal was greeted with a collective gasp. They really enjoyed themselves, thanks so much for putting it all together. I just wanted to let you know that I ran the girls version of the mystery with our group of guides last night and it was a rousing success! My co leaders we very impressed at how well balanced it was for children. They all came dressed up as their characters and were very shocked why it wasn’t the cook who had done the do. Fantastic! Thank you so much for sharing it! Some of my other leaders have asked if they could get copies of the materials and I’ve let them know that they can get in touch with you in that case. Just wanted to let you know that the party was a HUGE success. We were so impressed with the script and the quirks, and the clever props and puns. Well done and thanks so much for the material! Just to say thanks for sharing your murder mystery party resources. 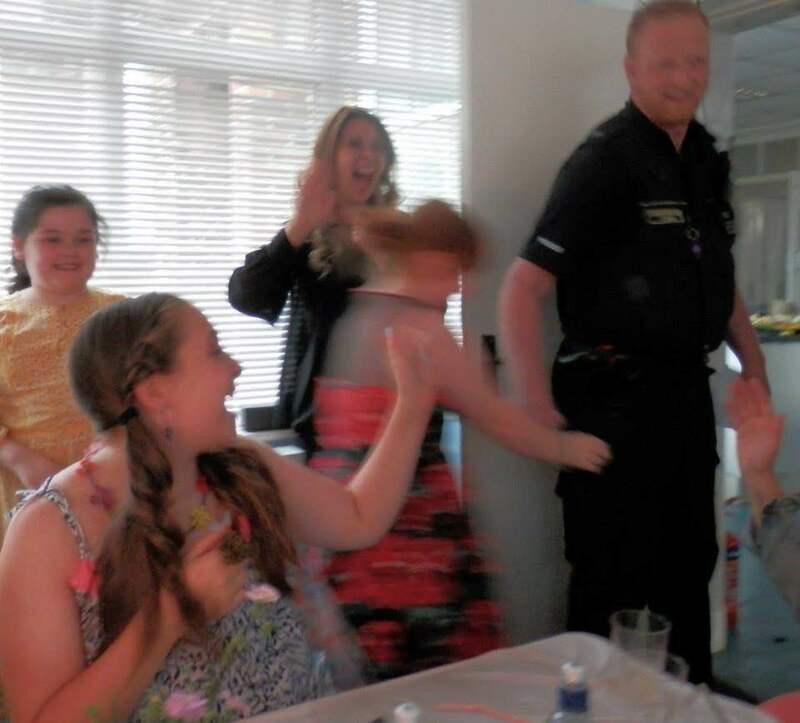 We had a great party at the weekend with thirteen 10 and 11 year olds and they all had a whale of a time. 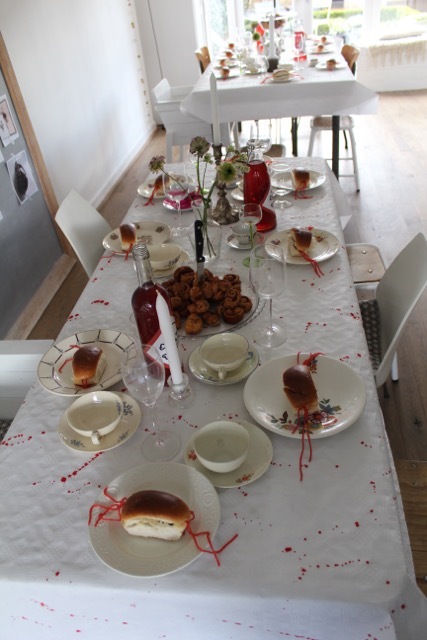 We added in a variation of 'alien autopsy' as a bit of a side show plus mug-shots and finger printing. It was quite an effort but well worth it so thank you again. Our party was yesterday, and it was a HUGE success!!!! We had 12 guests, so we used that version. I made small modifications to make it more relevant to the local kids (e.g., either changed some words - from "manor" to "estate", or names of magazine, charity foundation, etc. (to ones that they are familiar with) and instead of using the character names provided - used the actual names of the guests/kids - some of them didn't know each other so it was going to add another level of confusion if I gave a nickname to the new name kids were already trying to remember). We did a few other things differently. I did NOT send any information/scripts prior to the party. 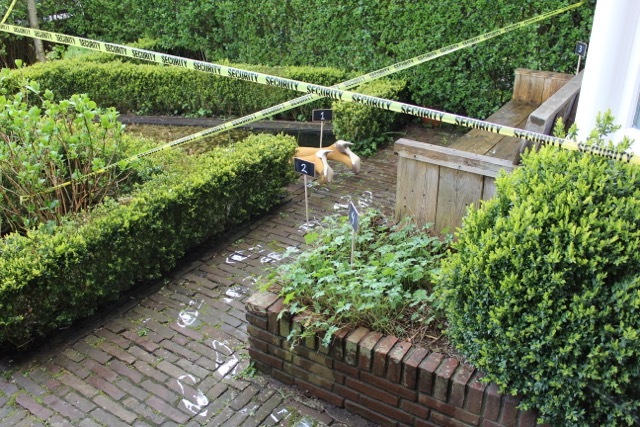 Kids only knew that it was going to be a Murder Mystery. They had their own theories and imagination of what it "might/could" be but no real idea. When they came to our home, this is when they discovered what character they were, the actual plot of the story, etc. 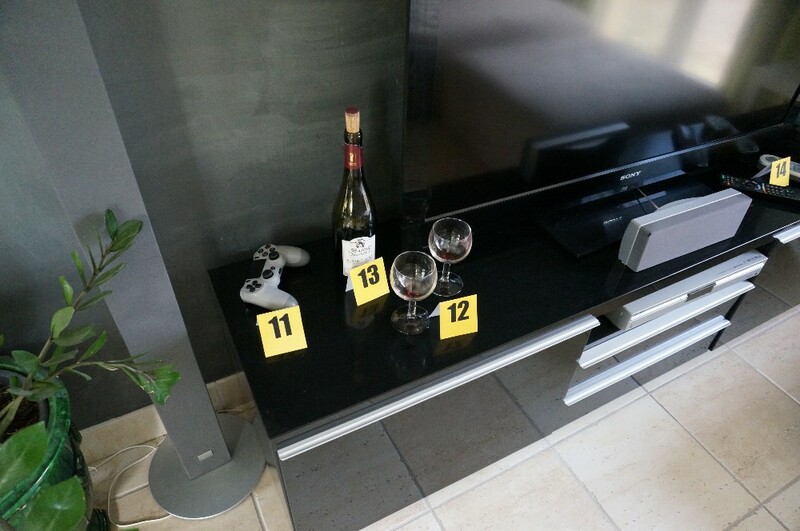 This is actually very similar to how adult mystery parties are done over here so we decided to do it that way. And we are happy that we did it that way as otherwise, we would have finished the party so quickly. Between kids reading their introductions, then later on doing Q&A among each other, the reading of the will, sharing their theories, suspicions, then confessions, eating, etc. - everything took only 1 1/2 hrs. I kind of anticipated that it may not take 2 1/2 hrs so we had another back up (additional) entertainment. 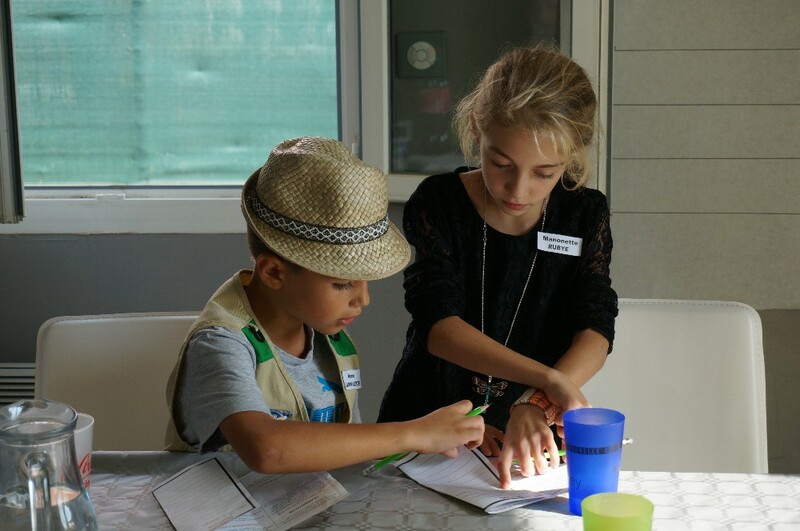 We added our own twist to the story by saying that not only the Lady was murdered but one of her jewelries were stolen, and kids had to find it. We had envelopes with puzzles with riddles hidden around the entire house. Here is an example: "Have you heard the NEWS? The next clue will be in your _ _ _ _ _." So, kids had to figure out that the word is "shoes" in this case. Go to the front entry way of the house where all the shoes were and look for an envelope with a puzzle piece and another riddle... that would take them to the next clue/puzzle. We had about 12 of these. Once they found them all, they had to assemble them, and they looked like a fingerprint. They had a sheet with 12 different made up fingerprints, and they had to see to which one that particular one corresponded. That was THE THIEF. That took another 30 min. Our party was for a total of 2 hrs, so it all worked out PERFECTLY! We have heard RAVING reviews from both kids and parents since yesterday. The party was a total blast. So much fun! And so smooth to lead and follow! They absolutely loved both the MURDER MYSTERY and PUZZLE/HUNT. None of these kids hadn't attended a party of that sort before, so now - we are a HIT in the neighborhood, thanks to you!!!!! I will make sure to provide your contact if anyone decides to throw a similar b-day party. I am very thankful for coming across your site and you sending me the script to aid me in prep of our daughter's 11th b-day. Thanks to you, it was a lot less work than it would have been, and we had so much fun prepping for it and executing it. 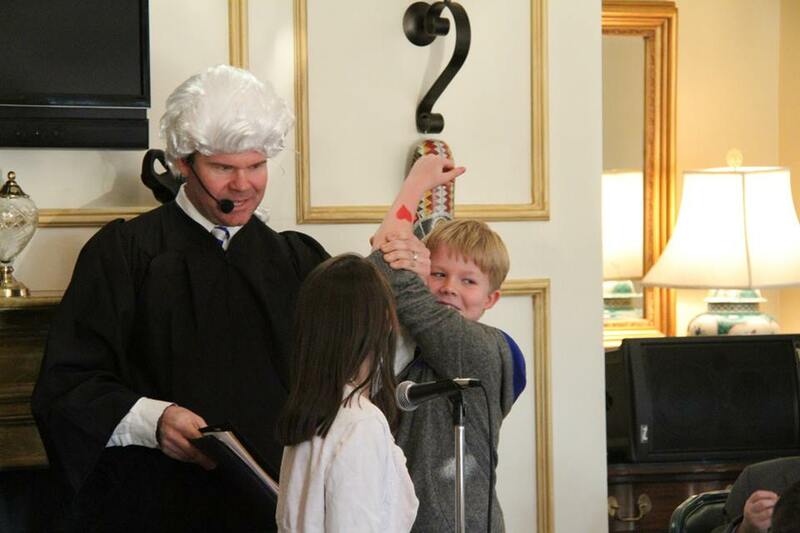 Our daughter (the b-day girl) was actually the Lawyer, so she wasn't a cast character. So, she led her own party and I think that was a lot better than if we (adults) did it. I mean - everything went absolutely GREAT! I really wouldn't change anything as I think post-mortem. I'm happy with the few tweaks we made and how it all went. 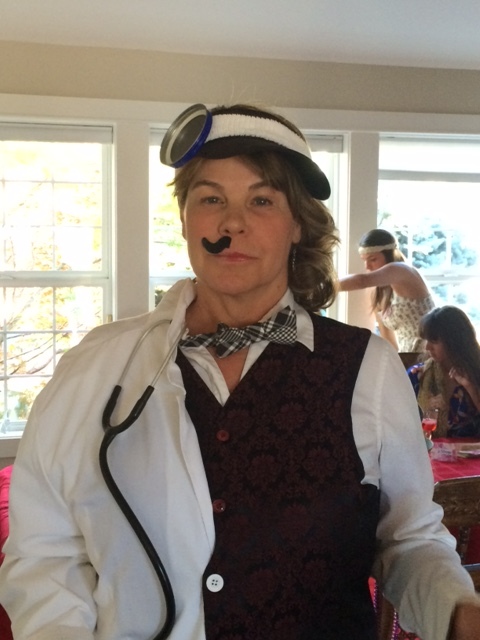 I wanted to thank you for your materials for the murder mystery dinner. 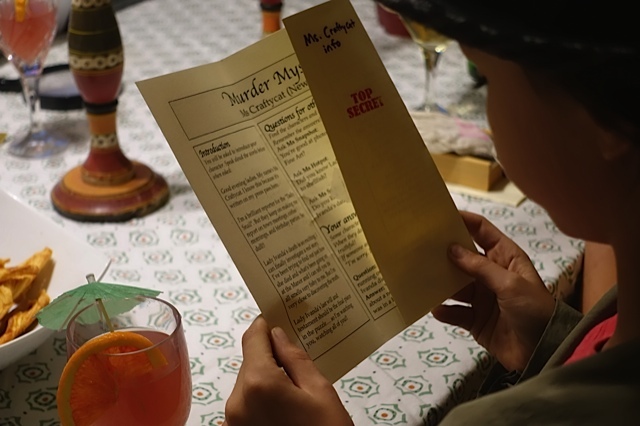 A few weeks ago, I had the murder mystery dinner for a group of teenagers in a group home for drug and alcohol addiction. These are teens who struggle to enjoy themselves and have fun in healthy ways. The dinner was a hit, and everyone had such a great time- both teens and adults involved. Without your generosity, I doubt this would've been possible. Thank you for sharing; it was a bright spot for a group of kids that truly needed it. Just wanted to give you an update on the Murder Mystery .... Success to the max!!! The kids loved it. I made sure each character had at least two props. They mingled and asked their questions of one another, all the while trying to figure out "who done it"! The reciprocal conversation practice was amazing. Thank you for sharing! I am glad to share with you my blog post about this event. I hope you enjoy it, even if it is in French! Sorry I am just e-mailing now. we had some problems at work following the birthday of my daughter Nura. It was a huge success. The party was for 13 year old children. Some said was the best party they ever had. I made some changes to adapt some of the characters but mostly I used Megan's Version. At the last minute we had 2 more friends coming so I added them as the detectives and they asked the questions from the characters so all would be aware of details. We had the prize giving for the best character dressed but that was a bit unfair as most of them tried their best. I wouldn't do that again. Again, want to thank you for the material. I will definitely use it again for my younger daughter's party when she is older. 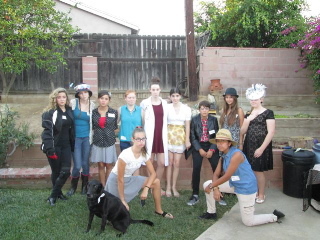 Thank you so much for the murder mystery party! 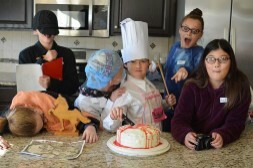 My daughter and her friends thoroughly enjoyed dressing up and figuring out who did it!! We added a character at the last minute for a total of 12 but it still worked like a charm. Thanks again for sharing and making her birthday really special! 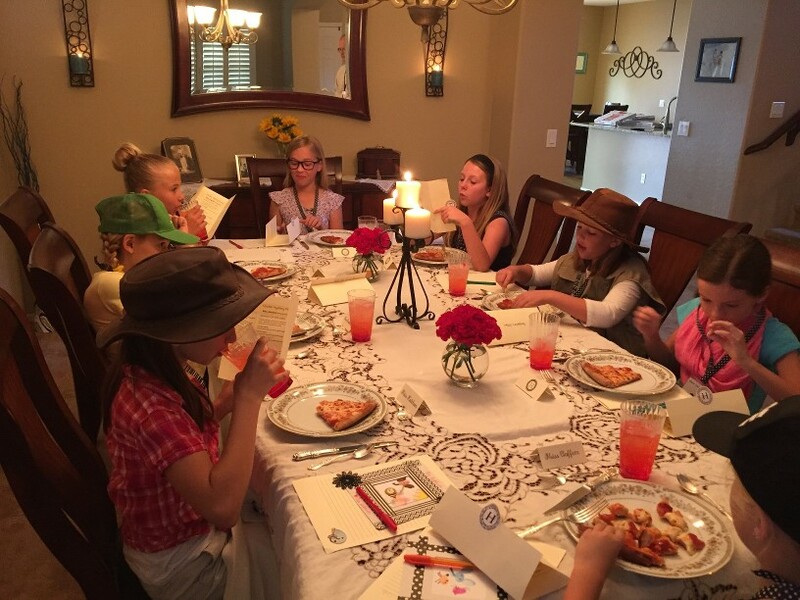 Mystery Dinner for all females, five 11-14 year olds and four female adults. The murder mystery dinner was a fantastic success!! We had two adults play double roles very cleverly!!! They split the attire on each side of their body to represent two separate characters. And at one point Dr Popdapill and Ms Ladyluck carried on an argumentative conversation by themselves as the adult actually argued the parts of both characters!! Hilarious. So much fun, thank you! I'm sending a photo separately. Hi Trevor, just had our mystery murder party on Friday and considering the little effort I put in myself I'm still buzzing. Wouldn't have been surprised if the cheers had made international news. The girls just loved it, loved being together, loved something different, the names just started them off. Everyone in school is talking about what a great event. I was a bit worried how to tie up a few loose ends in the story, but the girls didn't even notice, they were so spell bound by the event. Thanks a million from very happy parents and 14 girls. Now the party is over and I have recovered of having all these kids at home! I really want to thank you! It was a success! All the kids had fun and my daughter said it was her best birthday party of her life!! I am so happy for her! Thanks again a lot! 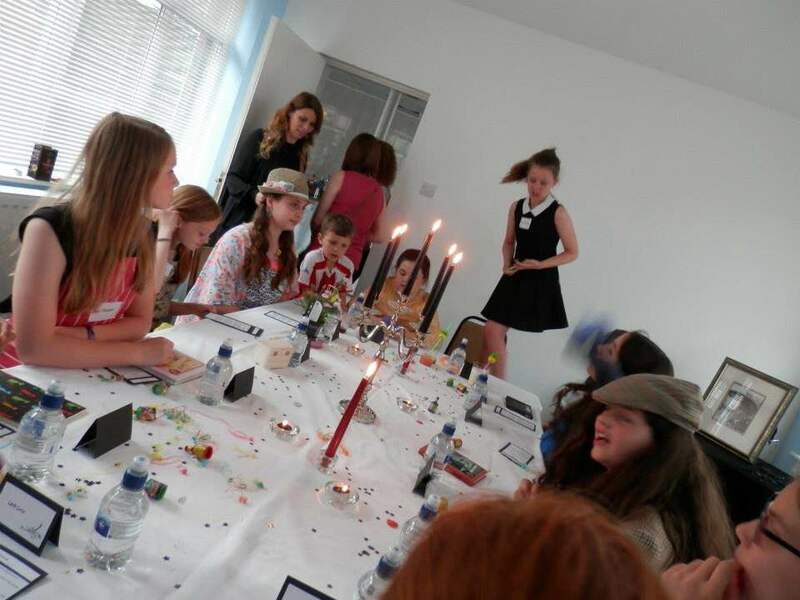 Just to let you know we played the 10/11 person 'murder mystery party girls' with our ten year daughter for her birthday party with 10 friends and they are all saying it was the best party ever. I was amazed at the effort they went to dress in character and to then act out with such confidence. A great day. We will send you a photograph from the party too......it had my husband in stitches when he had set it up. Kind regards, and thank you again. 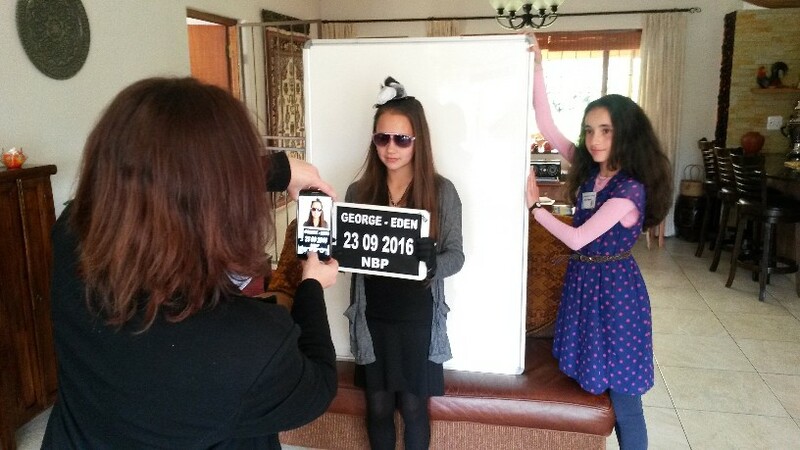 We really enjoyed the Murder Mystery party - we used it for our girls' 16th birthday. We ended up having 18 altogether so it was a perfect fit. The girls invited ranged in age from 13-17 and they all had a great laugh. Quite a few of them wanted to make their 'predictions' just before the confessions. It was surprising how easy it was to choose children based on the characters you had chosen! In the group was a great singer, a ballet dancer, a pianist, a photography geek, several stylish girls (fitting the model, the French and New York ladies) and a gardener to name just a few. They were delighted and their dramatic speeches funny to watch:-). Thanks so much for your generosity. It was a fabulous idea of yours, to create one for a children's party, and we appreciated the variations which you gave us. Thank you so much for sending the files. We used your original file and adapted it for 17 children (one boy and 16 girls, age 11-12). We had four grown-ups, which played Jules Bond, the murderer, the barister and the inspector. I translated it into Dutch and added the files, which you are welcome to send to anyone interested. The translation took quite some time, but luckily the party was shared for two birthday girls so that we could divide tasks; the parents of my daughters friend are great decorators as you can see from the pictures (which I will send you in a separate e-mail). 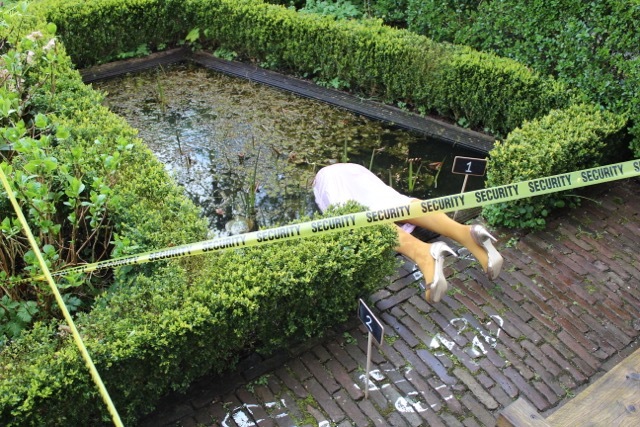 The crime-scene looked quite spectacular. Upon arrival the children were questioned and inspected and had to hand in their gifts. We started with a lunch on bloody table cloths and next took mug shots of all guests upon reading their introductions. 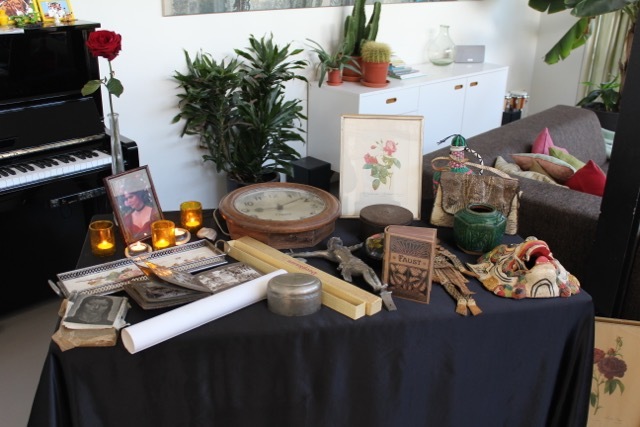 Then guests mingled to ask the questions and we had a treasure hunt to the other house in which the children had to search for buried pieces of the inheritance by GPS. The children had some discussions in two groups on what might have happened to the baroness. The plot reading took place in our house, where all antiques were on display and we had cake afterwards and finally gifts could be unwrapped. The children were really into it all, and the anticipation upon receiving the invitations was great. At this age, we could have added more suspense by having the treasure hunt in the evening or something like that, but it was already a great success. Home-made birthday parties like this are highly appreciated by all children! It was fun to do. We will give a donation to the Cliniclowns. 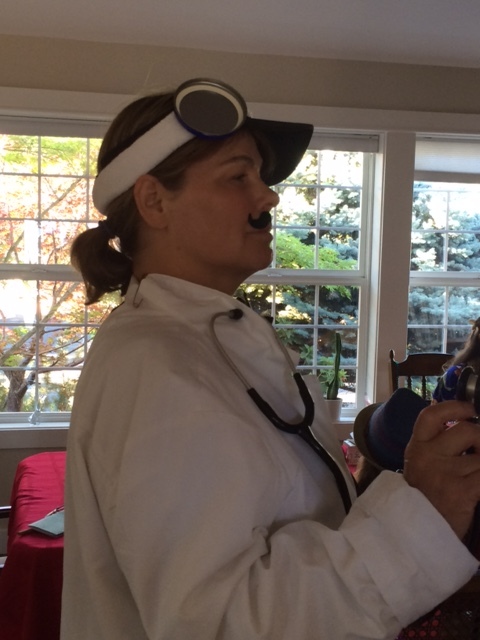 I wanted to thank you again for sharing your Murder Mystery party ideas. 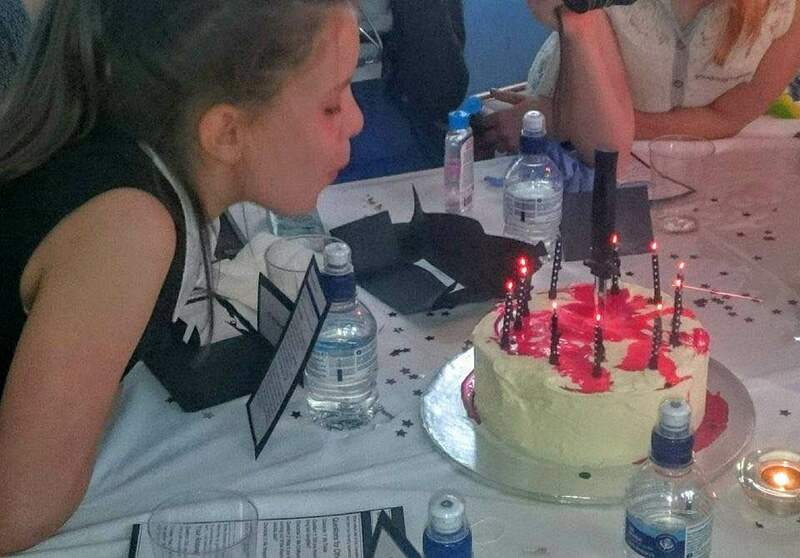 Our daughters 10th birthday party was on April 9th and it was a huge success!! 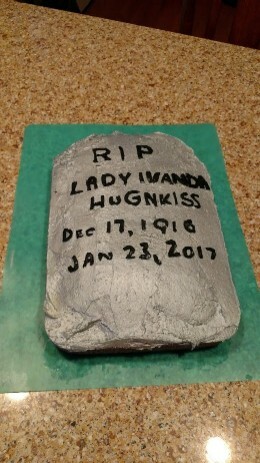 We had so much fun decorating Hugnkiss Manor for the party. We only had 8 girls so I had to tweak the characters a little bit to make it work for us. My husband and I got in on the fun as well! I shared their full Introduction in the party invite so they could get a better feel for their characters. I also asked them to keep their character a secret until the party to surprise their friends. 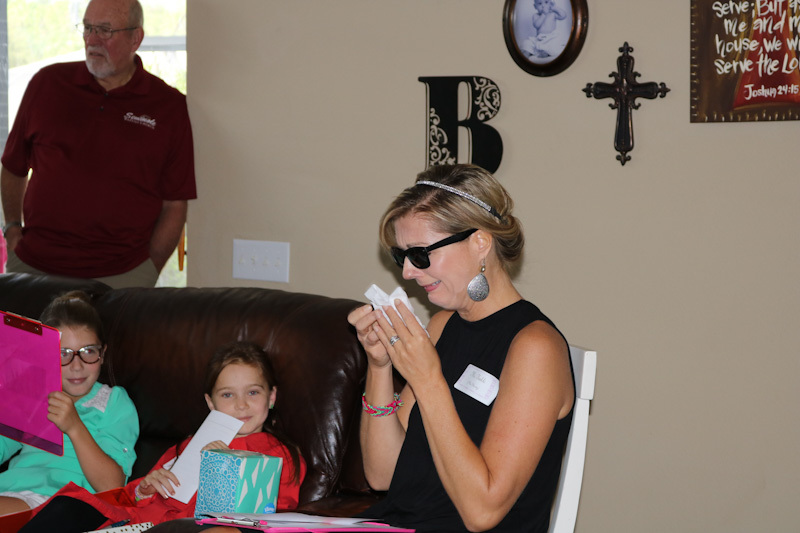 There were lots of laughs each time a new guest arrived and they learned what their friends' characters were. 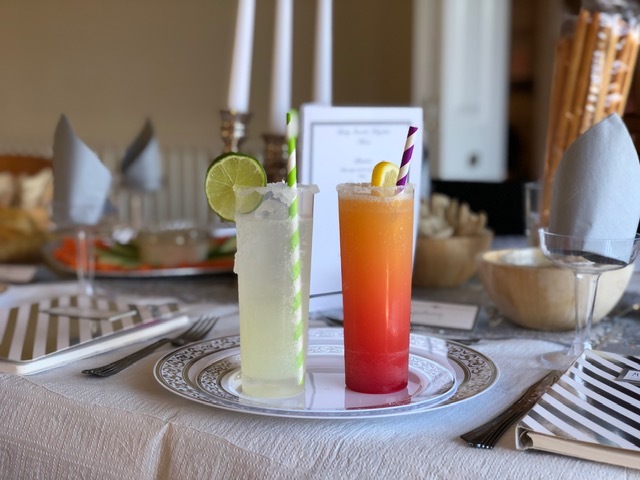 We served mocktails as they arrived. 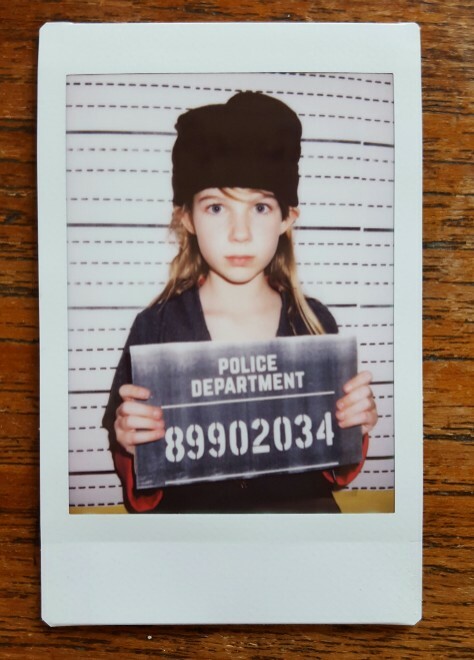 We took mugshots and fingerprinted everyone and made it part of their character name badges. They were very interested in examining the crime scene and noting any clues they thought they found. The girls couldn't wait for dinner so they could get started asking their questions. I also added a secret trigger for some of the characters so when something happened or was said, they would have to share their secret. It was so fun to see their faces when a secret was revealed and how it changed their thought process. They all really got into it! Our murderer was such a good sport too. Everyone had a blast!! My daughter said all of her friends are still talking about her party at school. This was the perfect age group for this! Thank you for helping to make our daughter's birthday one she will always remember. 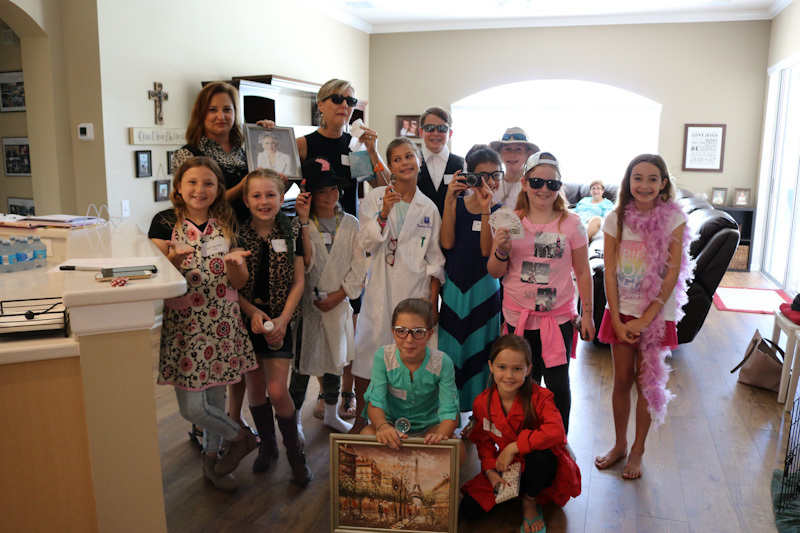 We did our Murder Mystery Mania last week and it was a huge hit! I had 10 kids sign up and then another four tagged along so we ended up with 14 kids, about evenly split on boys/girls. I had written "Mr." on several of the envelopes instead of Ms. and explained that the original had been set up for a group of girls. If a boy had a feminine pronoun or name, they were supposed to change it to masculine. No one even batted an eye at this- they rolled with it. They started out by at least half the group admitting to murder. 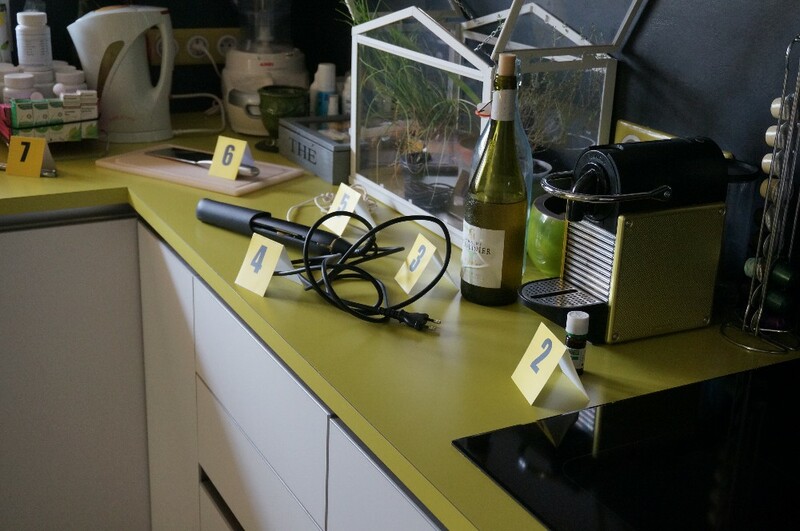 Lots of accusations flew throughout the program and at one point, the cook character decided he was the murderer and was trying to "poison" the snacks. Lots of laughter from all involved. They adored the goofy names and a regular patron might be Speedhump forever now. Accents, drama, and some serious overacting just made the night perfect. I've had requests from the kids and the parents to please do another one! Thank you so much for your great program and for sharing it with us. We all had a wonderful time! I want to thank you for sharing this material with me. I translated it to French and slightly adapted it. I noticed you had Swedish translations too, so feel free to add it to your website if you wish. Even if it's a mere translation, it took time for me to understand the mechanism and add some games I found funny. For example, look for the treasure in the bathroom in the dark with a light torch, or read a message from the baroness written with sympathetic ink. 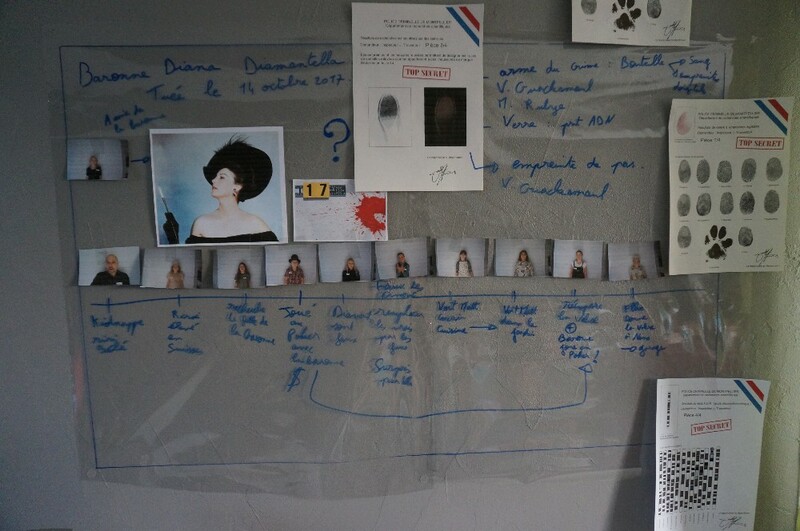 I also added some materials like pictures for the photographer or a press card for the reporter. Children liked it. Finally, this was a success. 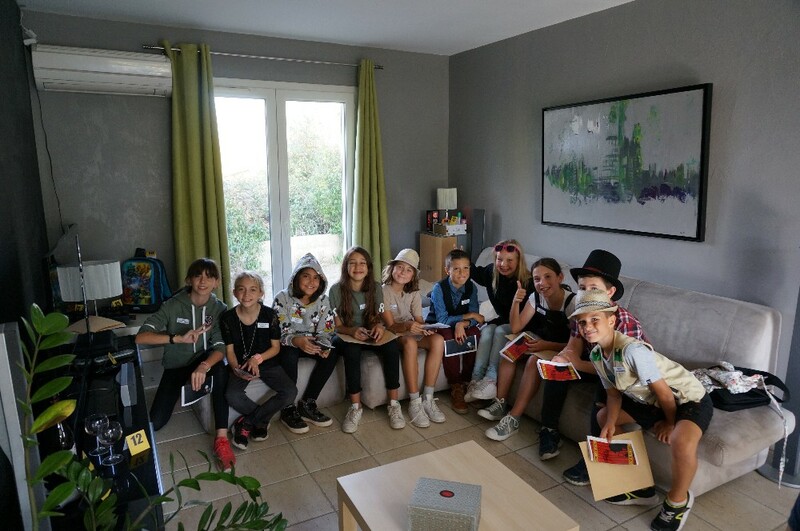 Kids enjoyed it and still continue the role game at school :) This was thanks to you and also Martine from banlieusardises.com as I found out your website through hers. Thank you so much for the party materials. The party was great and the girls had a fantastic time. There were 11 of them and they really enjoyed it. They worked really hard at asking the questions and discussing their findings! We used white boards to write the ideas they had on who the murderer was etc., and this was really helpful. Good morning Trevor, ... just to report that the party was a great success!!! 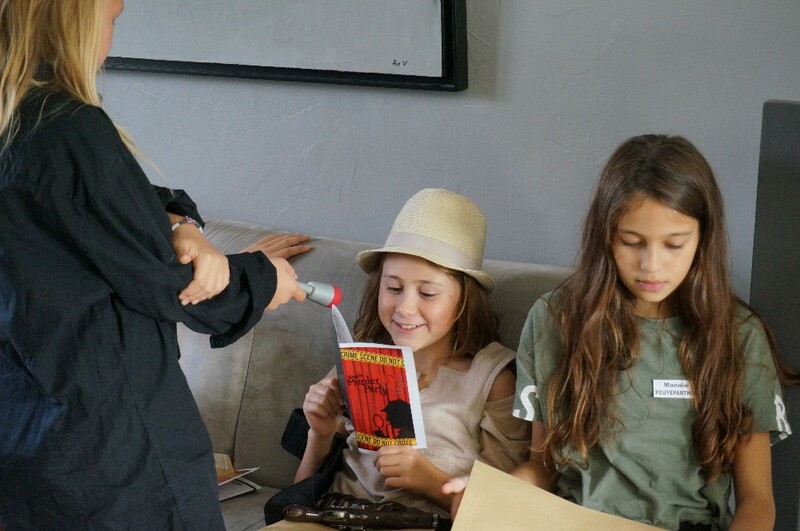 The girls loved every minute of it, they really got into it and tried to solve the mystery, it was great. Here are some photos,... my daughter is the one in the maid outfit (she was Miss Hotpot). Thank you very much, again for sharing your game with us! it was brilliant! We used the 1930's train theme script. I edited details and made some characters able to be guys, as needed. I then added a will-and-testament with surprise twists that turned the whole story into a noble mystery (which is my daughter's favorite type of adventure). My daughter absolutely LOVED it and her Sweet-16 party was a hit with all of her friends, even the shy ones! :-) Thank you so much for helping us! We had a fantastic time! 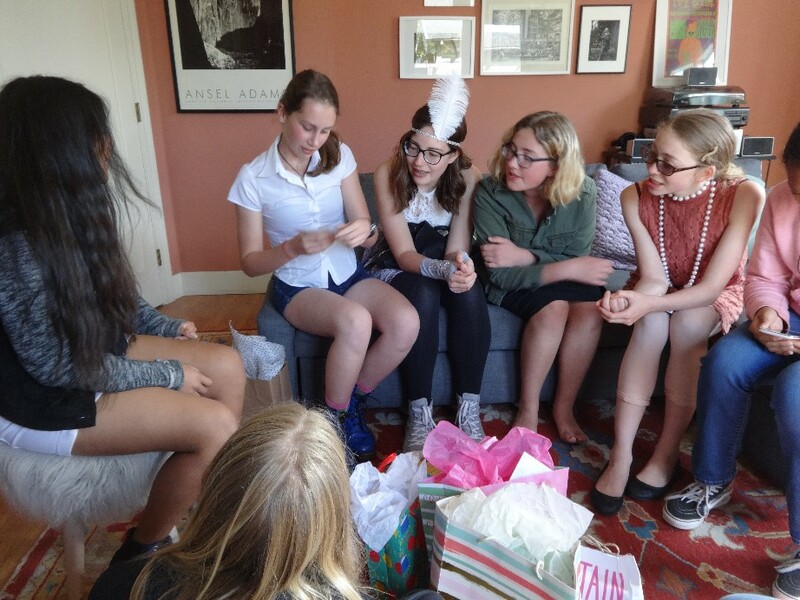 Thank you so much for the inspiration and sharing the two all-girls’ parties for 10 to 11 girls — my daughter, whose 11th birthday we were celebrating, and all of her friends loved this party. 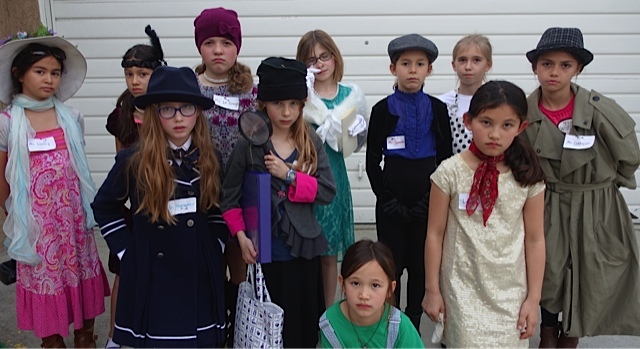 As you can see from the photos, the kids got into costume and character, and had a blast solving the mystery. It must be amazing to see your party idea spread all around the world, over the years. Thank you for your generosity from Los Angeles! We are donating to Medecins San Frontieres/Doctors Without Borders in support of health care for refugee children and families. Chauffeur Ms. Speedbump, Dr. Feelbetter, and Ms. Spyglass the private eye. 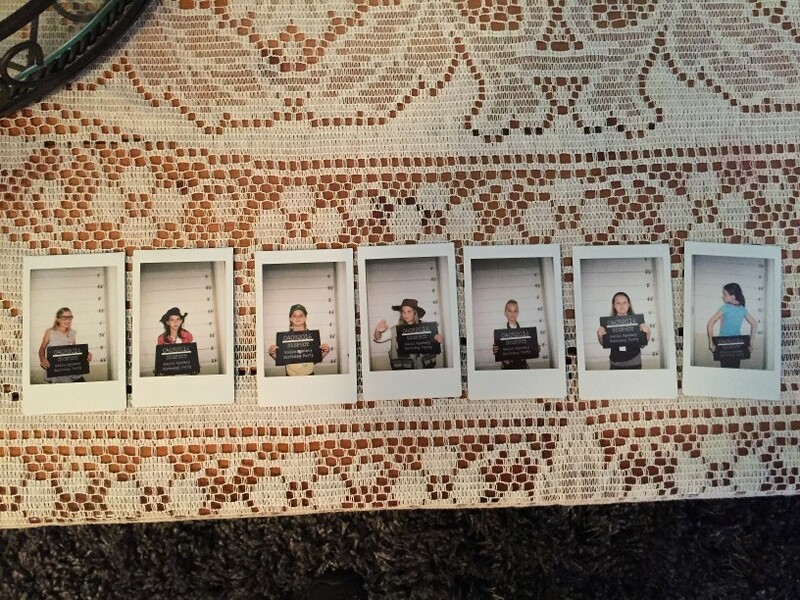 First stop: mugshots for all suspects. Round up the Usual Suspects! And then let the usual suspects get silly. After cocktails, we settled down for introductions. Ace reporter Ms. Craftycat introducing herself. The red Top Secret stamp came in handy. Guests circulating to ask each other questions and gather information. What do you know about Lady Ivanda’s art collection, Ms. Snapshot? Freddy Farr reading Lady Ivanda’s last will and testament. Confessions, and the story starts to fall into place. Ms. Finkle reads her confession. PS Found two more photos on my phone that I wanted to send you. Thanks again, our party was the talk of the fifth grade for the week before and after! Do not cross. Police Department. 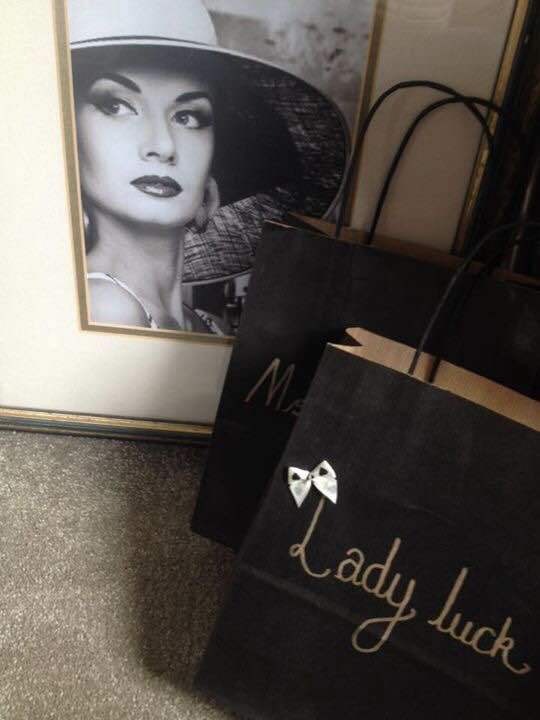 Thank you so much for sharing your material for the all girl murder mystery party. The girls had a wonderful time! Such an awesome alternative to a regular party. I had 12 girls ages 8-11. My daughter, the birthday girl was the culprit! The girls are still calling her Ms. Tinkle at school. 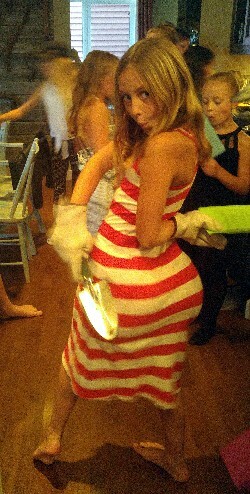 We decided to do this type of party last minute so I gathered props & costumes & handed out parts as the girls arrived. They got into character & I let them study their roles about 30-45 minutes before we started the introductions. This worked out well but I know it would have been even better if they had their roles in advance. We had so much fun though. The adults were wanting to plan a party next! 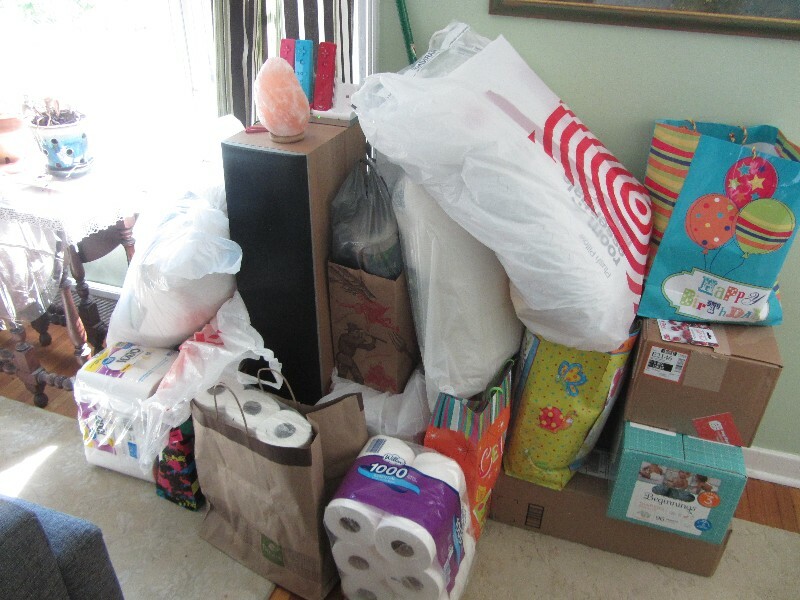 We made a donation to the Oklahoma Baptist Homes for Children. Thank you again for your creativity & willingness to share! 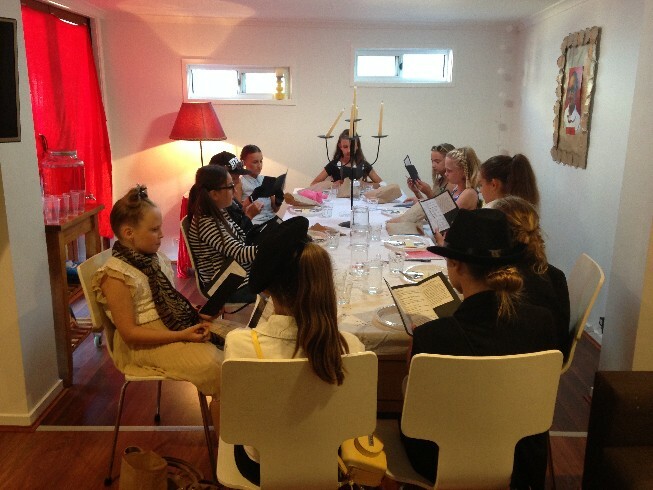 Just to let you know that we did the murder mystery with 11 girls and it went really well! Thank you so much for the party materials. My son and his friends had a blast! Just wanted to let you know that the party was a great success this weekend! We only had six girls, so I had to adjust the script slightly, but they were very engaged and did a great job talking through their suspicions. My husband and I want to thank you for the murder mystery party package. 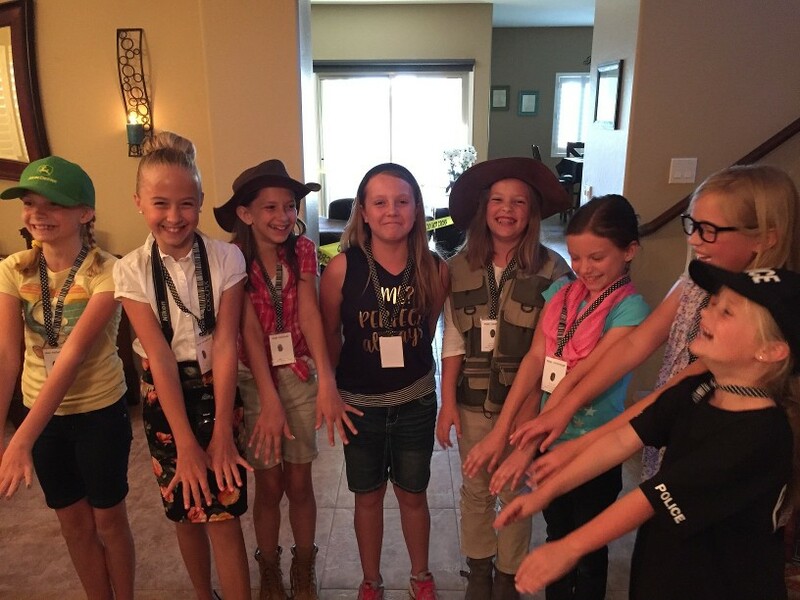 We used the "12 All Girls" package this past Halloween for our daughter's 10th birthday slumber party and it was a blast! The girls were talking about their characters the next morning over breakfast and again at school on Monday. 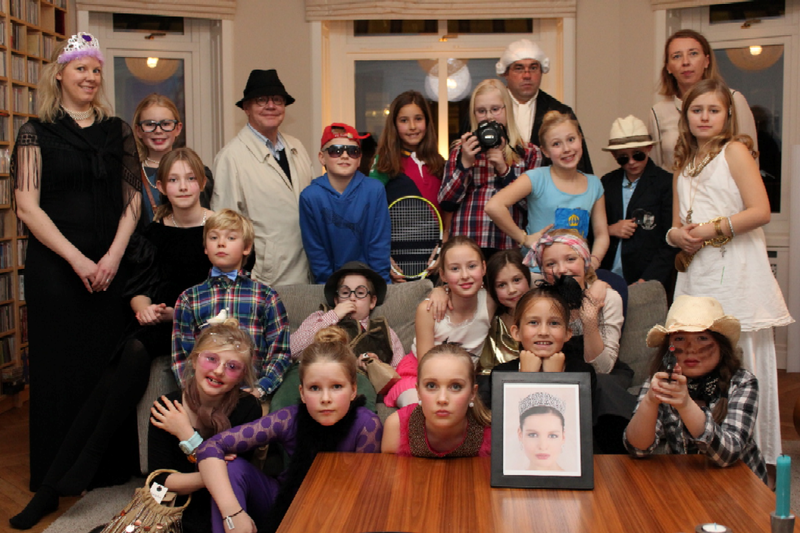 It went over so well that a few girls have asked their parents to host a murder mystery party "just for fun". Just to say thanks, the murder mystery you kindly shared went well, we adapted the 11 girl piece to include ghost hunting in our loft. 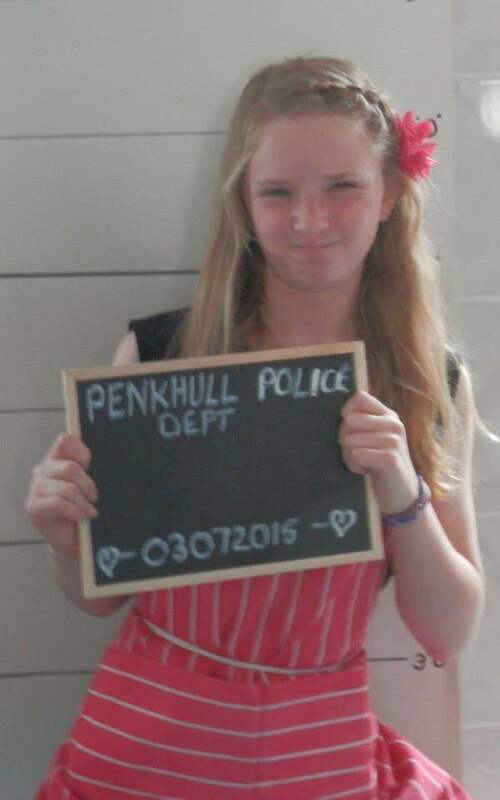 We also arrested the murderer and used sweet whistles to perform the tune from the great escape to rescue them! I've donated to the Alzheimer's society and cancer society. 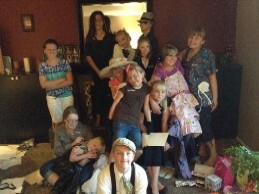 We had a wonderful party with 8 13 year old girls, and an older brother playing the murder victim. 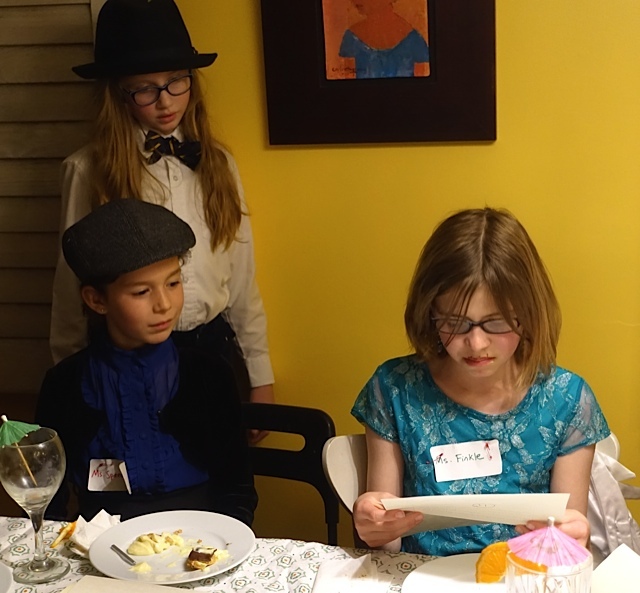 My husband and I played the Maid and Butler, and served the girls a "gourmet" dinner as they stayed in character solving the mystery. A great night thanks to your materials. Thank you so much for the mystery party. Here is our gang with sad faces, because they are not sure if they are the guilty one yet! We had a wonderful evening on my daughter's 14th birthday. It was a ton of fun. Thank you for generously sharing with us. Best to you. May there be many more parties to come! 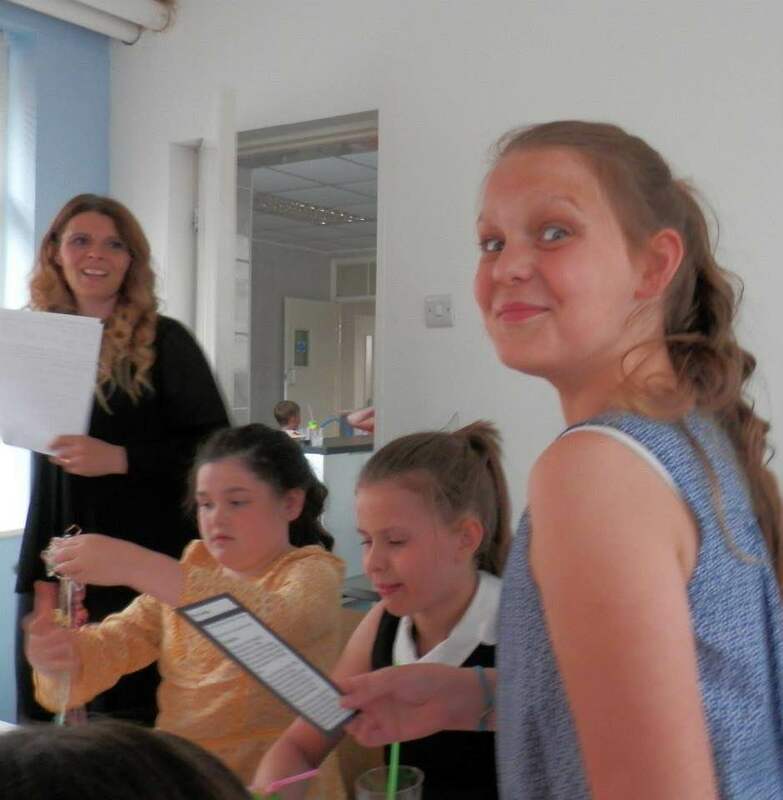 We ran a very successful Murder Mystery party for 12 girls yesterday - still recovering, but everyone said it was fantastic and our daughter and all her guests absolutely loved it! Thank you very much for your material! I've attached our modified version of the girls' murder mystery materials; I hope they're useful. I changed the documents from PowerPoint to Word so I could use a mail merge to generate them from an Excel spreadsheet. I fixed a bunch of typos and improved some wording. And I also created a version with an additional character, i.e., 12 girls rather than 11. And I wrote a more thorough Notes document explaining how to use it all. For convenience I've included PDFs of the result of the mail merges as well. You're welcome to use and distribute this material however you like. Once again, thank you very much indeed! Elie's 10th birthday party was a huge hit! She said it was her favorite birthday so far. Thank you for helping make it so much fun! We made a few tweaks to the content, in order to make it fit the American players. We also decided to have the guests arrive dressed formally for a dinner party and then draw a character name out of a hat. That way, I didn't have to decide who the murderer would be. I played the inspector role and read all the motives before each participant read their confessions. Even the murderer didn't know it was her until the last moment. They all seemed to really enjoy the suspense. I'd be happy to send you the altered documents, if you like. In light of the refugee crisis, Elie chose to make a donation to savethechildren.org. We held a party based on your script in July and it was a great success. 21 ten - year old girls trooped up to the candlelit bedroom to see the corpse laid out, with a requiem playing in the background. Some even insisted on bringing their parents up to see too! I have attached the amended script. It was a lot of work, but great fun for all concerned, and some of the most reserved children blossomed into full-blown characters on the day. We have made a donation to a local children's refuge as suggested. Thank you once again for sharing your great idea so generously. I have attached the amended script. An update on our night. Reading all the comments I decided to find a way to be one step ahead of a room full of excitable 11year old girls. I sent out the invites with a sample of their part so they were able to rehearse and get a gist of the characters between them on the play ground. Then on the night the same was left on the table. I opened up the proceedings by asking the girls to announce who they were. All were super confident because they were familiar. I then handed them each a card of the questions. Each had a label on their outfit so no-one wasting time trying to second-guess their characters. At this point they ate and had music. After 40 mins I asked them to return to the room for the reading but a court room scenario unfolded where I told them their secret and my helper was in turn handing out a sealed secret. They were squealing with delight. I should point out that the parents who intended to kiss and run actually stayed and got involved. bonus. Anyway with the ambient background music changing to happy birthday at the crucial finishing of the 8th confession the room became tense with second-guessing happening from each and every one. In the end as the last sentence spilled from the confessor my local bobby turned up and made the arrest. The parents were in hysterics. 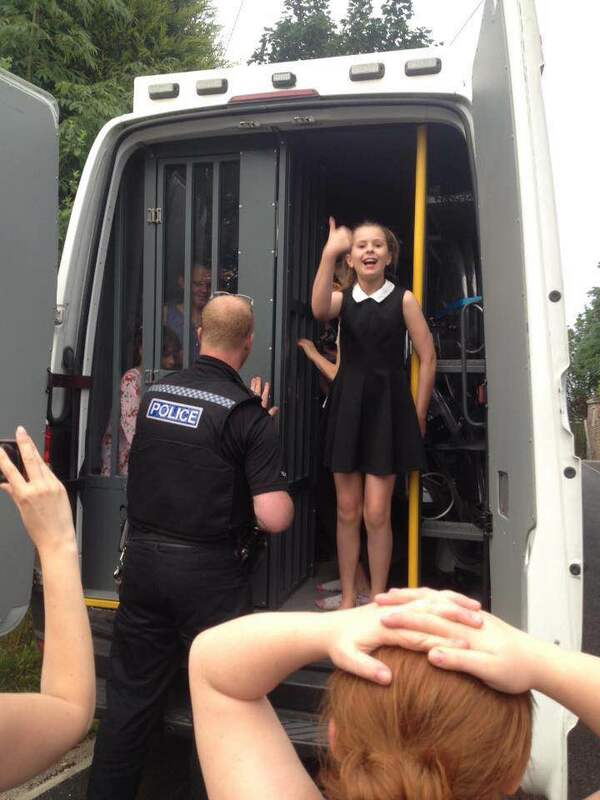 Permission was sought in advance as having an 11 year old handcuffed and led to a police riot van. I may have been pushing my luck. It was fabulous. We had the very very best night. The more pre-organisation, the better the event. Amelie my daughter has chosen to donate to the children in Napal after the earthquakes. An aquaintance was teaching children in a village at the time of the disaster. Thanks again, your creativity has given up a precious memory for the summer of 2015. Just a quick update regarding the murder mystery, as I used it in my GCSE Drama lesson yesterday. It was really good fun and was a great way of allowing students at the very start of their GCSE course to begin to think about creating character from limited information, rather like they will do with a play text, further down the line. I have attached it as I used it in case you wish to keep it for future enquiries. (Add in the Poirot theme music as the enter the classroom!) It has undoubtedly lost some of the fun and flavour of a 'party' because I was using it for educational purposes, but if it is of any use then please keep and share - I am not precious; much of it was not my work anyway!! For info, I ran it in a class of 14 Year 10 students, using a cut-down and tweaked version (some of the characters were originally to ask questions of characters that didn't exist in this version) so that I had two groups of 7 characters. This further enabled us to discuss why some characters are pretty much the same regardless who plays them, and why others leave much more up to the actor's discretion. Despite them being a mixed-gender group, everyone played a female role and wore an evening gown and hat provided by me, which added to the fun! (Fortunately they are a very willing group!) The killer was found out incredibly quickly by the one group, and not until the very end for the other. For the group who finished early, they had extra time to improvise and develop their characters and interactions with others. Thank you for this. It did exactly what I wanted it to. Just wanted to let you know that my daughters party was a great success and that everyone including my husband and I had a great time! 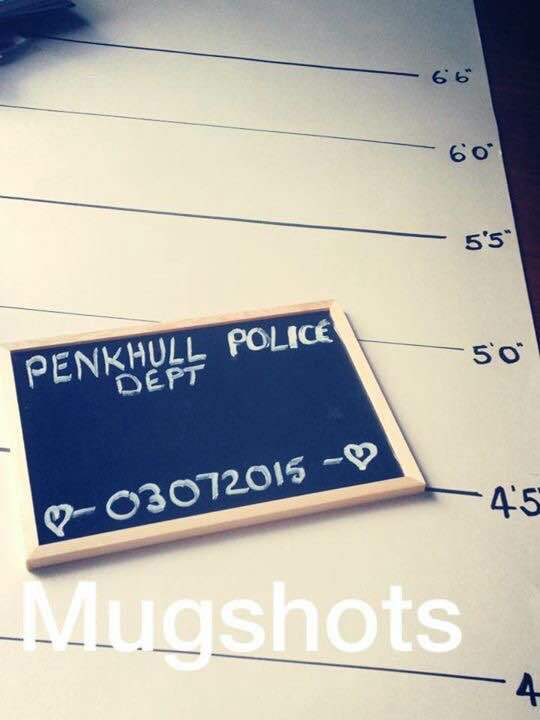 We set it up so that a friend was security for the arriving guests and they got frisked before coming in. Then we had a viewing room set up where the kids could pay their last respects to "Ivanda". That is where I gave them there various instruction cards. Then they headed off for sparking mocktails, introductions and mingling for the Q&A before dinner during which accusations and confessions took place. It was a night full of fun and surprises! Thanks for sharing your - and Beth's - creativity with me! Apologies for not emailing sooner. 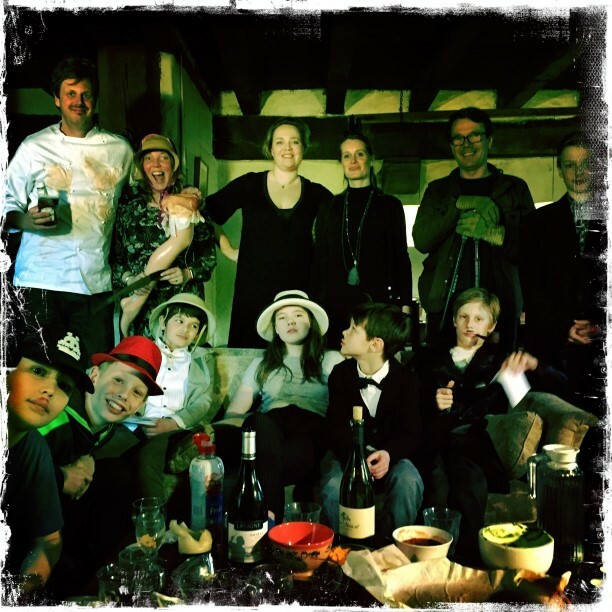 We did the murder mystery party for my daughter's birthday and it was sensational. The girls were aged between 8-10 and each and every one of them had an absolute ball. They all made a great effort in dressing up and getting into character. All the adults dressed up as 'the help' in Downton Abbey style. The adults were texting me afterwards thanking me for inviting them to help as they had such a great time. We all, kids and adults alike, laughed from beginning to end. Thank you so much for all your help. I think this party will remain in the minds of everyone for a long time to come. Thanks so much for helping us to make memories to treasure!!! I just wanted to say thank you so much for the Murder mystery party!! We just did it on Friday night with 11 girls and it was a HUGE HIT! My daughter wanted a Nancy Drew theme, so I altered things just a bit. She's also a huge reader, so I made the Lady Ivanna character's fortune a rare book collection. 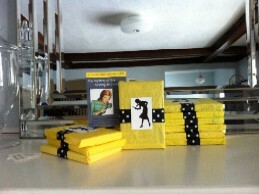 As loot bags, each girl got a Nancy Drew book, so we put it in the will that everyone would get a piece from the book collection. Thank you so much, it was really a great time! I have attached a few things that we did, in case anyone else would benefit from them! 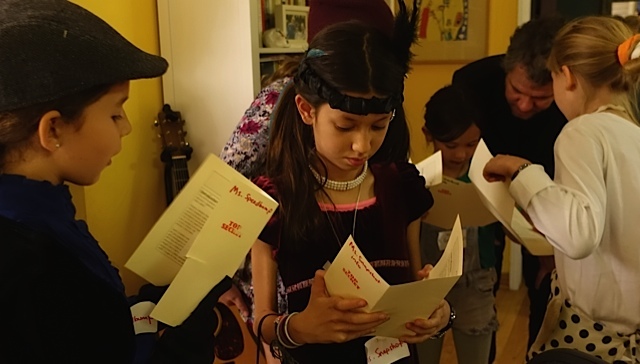 We sent letters to each participant the week before (who were mostly 9 years old), to introduce the characters, build excitement and give the girls a chance to plan costumes, and to ask their parents about what a Will and Testament is! It helped a lot to move things along, that the girls already understood what was going on. I wanted to thank you very much for the helpful info you sent on for the murder mystery party. We did act it out and it went down very well. We did a shortened version just over a party meal because we had a cake decorating party before that. Sorry it has taken me so long to get back but I wanted to let you know that our donation will go to Marie Curie who provide nursing care and support to over 40,000 terminally ill people and their families across the UK. So thank you for your part in that too. 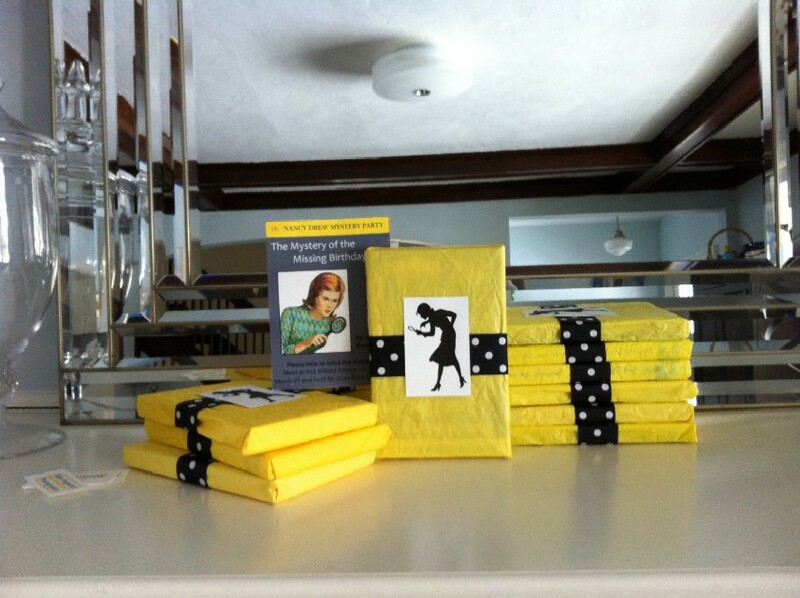 Thank you so much for sending over the wonderful resources for the girls-only version of the murder mystery for kids. My Guide & Pathfinder girls had a ball with this activity at our January sleepover! Thank you again for the Murder Mystery Party materials. The celebration was a huge success and my daughter was very happy. All the participants were really enthusiastic and we all had a lot of fun. 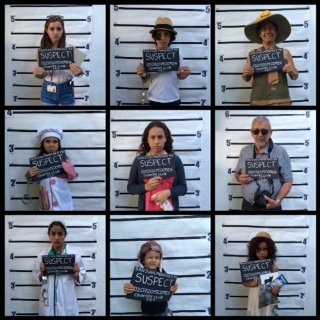 We made a 'suspects wall' and took pictures of all the guests. 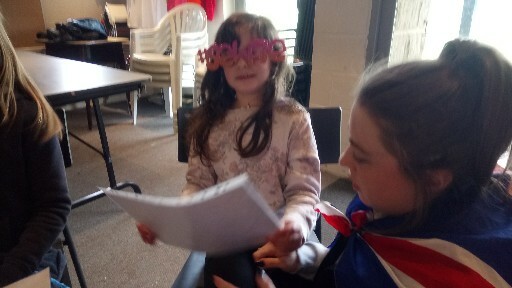 Just to let you know that we held my daughter's murder mystery party at the weekend and it went really well, everyone including the hosts (mum and dad) had a fab time and got into the characters and plot. Many thanks, will recommend your website to my friends. 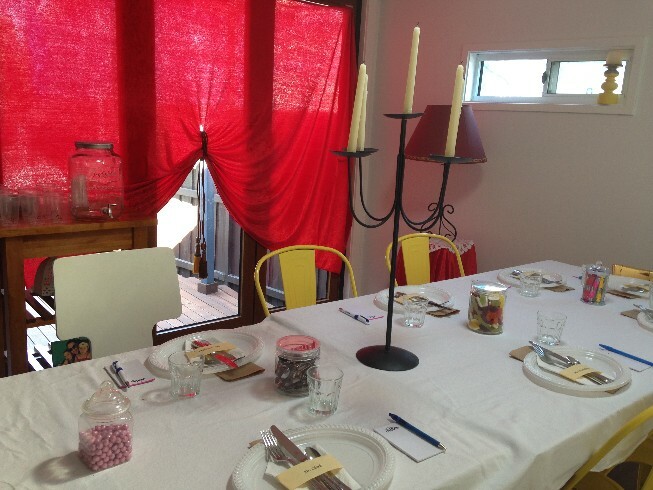 We hosted my daugher's party on Sunday and it was a huge success. 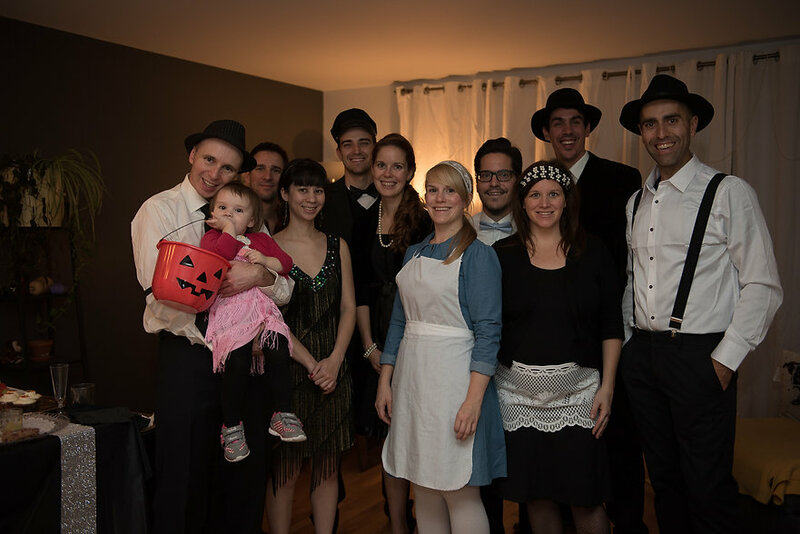 The 9 guests (plus my two children) came in costume and my husband and I were the lawyer and housekeeper, respectively. Everyone was so engaged and it was a lot of fun. Thank you for sharing your material. We have chosen to donate to our local Children's Hospital Foundation. Just to let you know the party was a huge success. The girls had a blast and really got in to the questioning and fun of it. Thank you so much. Thank you so much. Will try the version from Beth and let you know how it goes. Very excited! I just wanted to report back how great our party was. The girls loved it and were so excited the whole time. Boy were they loud with the excitement. It was so fun to see them do something new. There were a few words some of them had trouble reading aloud, but over all, it was fine. We just helped them when needed. It might have helped if I was more organized and sent them ahead of time, but really, thank you so much. One of if not the best parties I have ever thrown. 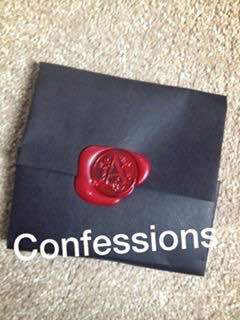 I cut out the confessions, so they really didn’t know till the very end, and handed them out as they read them. Again, Awesome & THANK YOU. I just want to Thank You so much from my heart for your help in making my daughter’s 11th birthday a success!!! The party went perfect and she told me this was the best party she has ever had, which says a lot since she has had a party for every birthday!!!! I really appreciate you emailing me back and for having your website! I could have never pulled this off without your ideas! Again, I thank you and will definitely be sending others to your site! One mom has already said she would be going to the site to do a party for her daughter’s sweet sixteen!!! I will be making a donation to Breast Cancer and I will let my daughter pick a charity to donate to!! 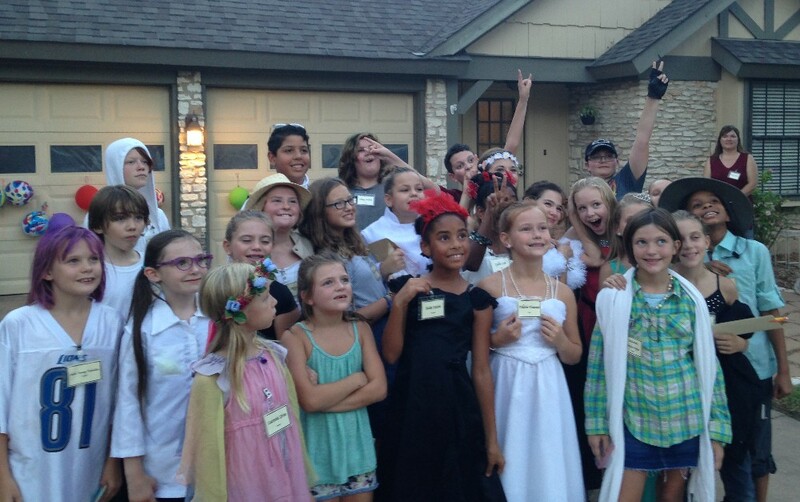 The Murder Mystery Party was a huge success! I rearranged the slides into one PowerPoint. If you are interested, I'd be happy to send it to you. 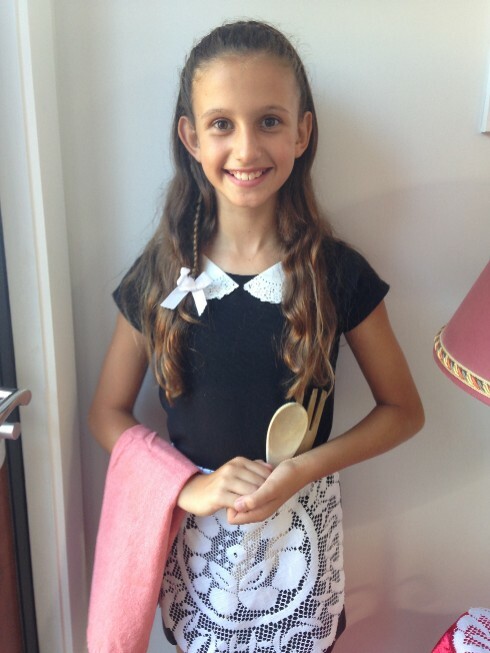 We held Neve's murder mystery birthday party on the 8th of November. Dare I say it, it was a huge hit with the kids. The parents were a bit impressed too, ha, ha! We really spent quite a bit of time to personalize it to the rural community within which we live and to the kids characters. The girls all seemed to take on their characters and stayed, for the most part, in character. 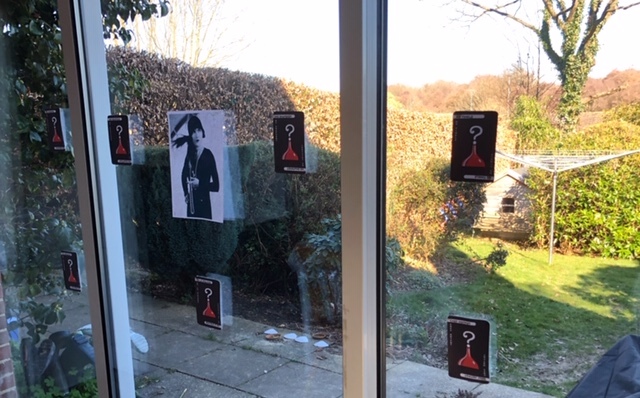 We stuck up some signs around the house to link in with the storyline and so we moved around a fair bit. We had in our front living room (spare room) the dead Lady's body laid out under a white sheet. The body was towels moulded to the human form! Hair was peeking out of the top whilst her boots were sticking out of the bottom. The kids seemed to very much enjoy that the will was read out in this room whilst the dead Lady was laid out. We had photos of each character with a quote which we thought was fairly amusing running continuously through the t.v. 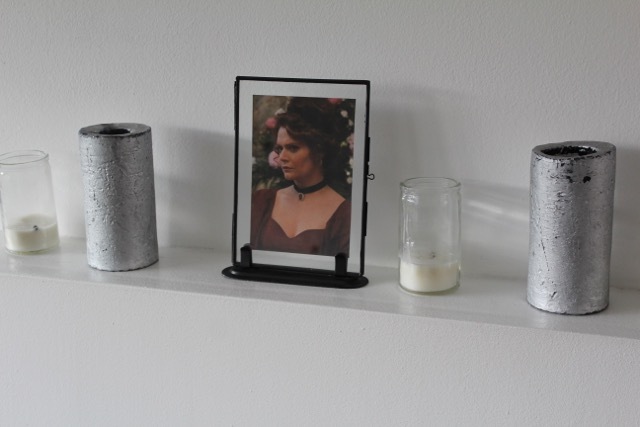 A photo of the late departed was hung upon a easel with a candle burning nearby. All very atmospheric. I have attached some photos and the thank you letter from the Spotty Zebra's group to whom we donated £20. All in all it's a big thank you to you for your help! Thank you once again. The murder mystery was a hit. The party was for a group of adults at our church, and we had never done one before. I didn't tell them until they arrived that we were having a murder mystery, so I was a bit nervous they wouldn't want to do it. But all turned out well, and the guests were portraying their parts wonderfully. I had many compliments about what a good time the guests had. Thanks for the use of your script to allow us to have a great evening! Thank you so much for this information. Let me try and tell you how this all worked out. First, we ended up inviting 16 girls because we assumed that a few of them would not come to the party. We only had two not show up the day of the party. This was a little problem so what I ended up doing was taking 6 additional characters from the kids party and rewriting their scripts – I could send them to you if you would like to see how I tried to piece it together. In hindsight, I might make invitations and when they RSVP I might send the scripts. Then I would know who exactly would be there. It turns out that I told the girls I was the lawyers secretary and that if they had questions they should ask me, including the questions of the missing party guests. 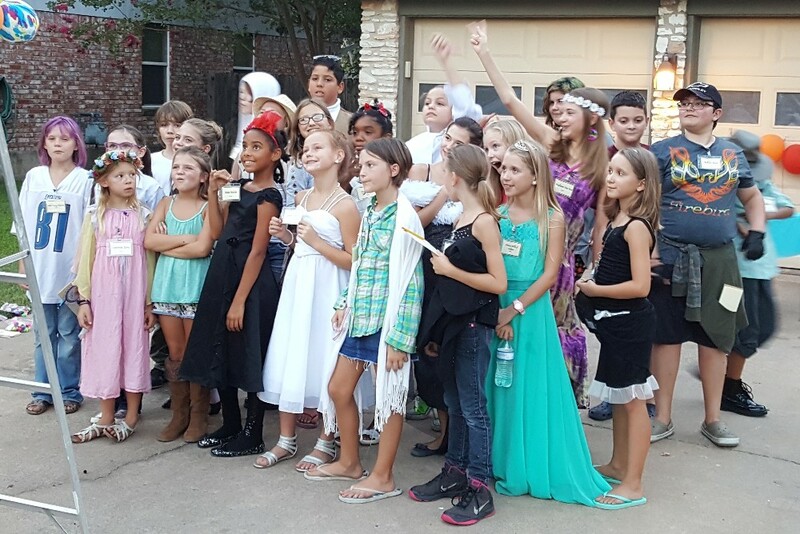 The fun part was that all the girls seemed really excited, they found costumes to fit the 1930’s theme and even the parents thought it was a great idea. We started with meeting at the train station (the living room) and read our introductions. Maybe a story could have been sent ahead of time too so they could already know each other. There was a lot of reading. Then we left to go to the “train” and had teeny tiny appetizers. The girls thought it was fun to eat in the dining room and the miniature snacks were a hit. 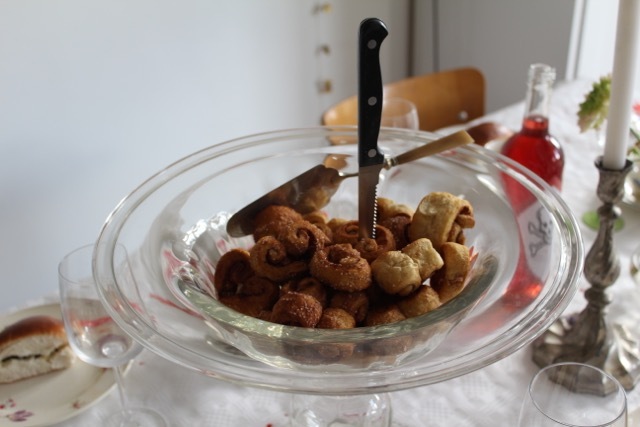 We gave each girl the smallest of silverware and glasses kind of like what you might have found on a train – each one meatball, one shrimp and one crudité. We headed back to the French country estate (the living room) where the will was going to be read . then there were the secrets all the guests read to show that they might all have reason to kill off Lady Ivanda. At the end I am not sure if the girls could make sense of it at all but they all laughed when my niece who was Lady Ivandas lawyer announced that she “couldn’t take it any more” and that she was the real killer because the estate had a secret vineyard that would have been left to the lawyer after the rest had been done away with. One girl even said she forgot to read her secret and announced her part later even after we knew who did it. Ha! I have to tell you that the birthday girl had an excellent time. The party was a success. In going forward I think the girls, age 10, probably need a little more activity to use up 3 hours of standard party time. Possibly, I might break them up into teams, make them do an activity to reveal a secret or maybe have them all follow clues to get more information. That way they all wouldn’t end up in the living room reading. Thank you for helping to make a cool event for my daughter and her friends. I should tell you that we, on the same day, helped a family with 4 kids who were losing their home. We made a donation to them and helped the kids get settled in to some temporary housing. Now we just have to plan a Pokemon party and a Lego Mindstorm for each my sons and their ten closest friends. Wonder what we will do next year. I hope you have a wonderful day and many thanks to you for your creativity. 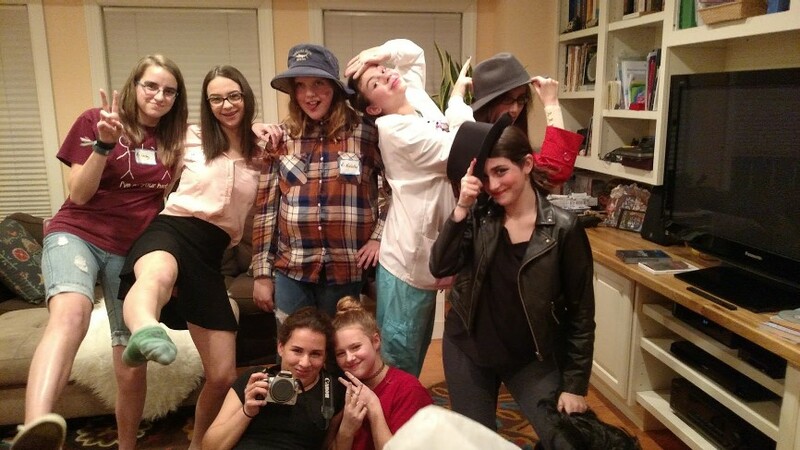 We had our Murder Mystery Party for my daughter’s 16th birthday and it was a total success. My husband, daughter (10), & son (14) had to step in as we were short a couple of characters and my daughter (11) was a maid and I took the role of Barrister and general “runner of the party”. 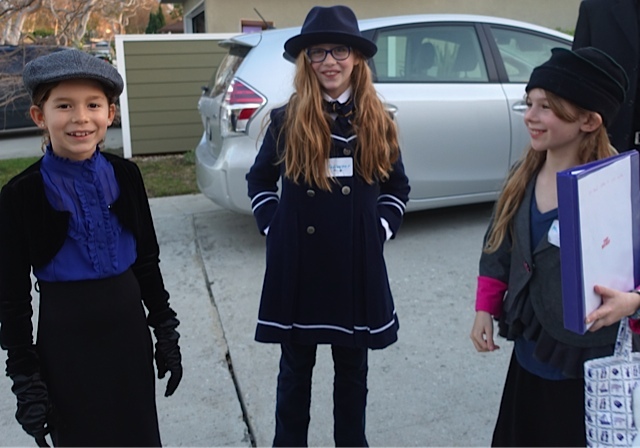 All Anastasia’s friends came wonderfully dressed in character. I decorated the house with candles everywhere, cobwebs and spiders, I borrowed a skeleton and I set the table with black dinnerware and candlelabra. I also put a white toy box we had in the room draped with a heavy lace tablecloth and placed a candle, a photo of the deceased and blood red flowers on top. 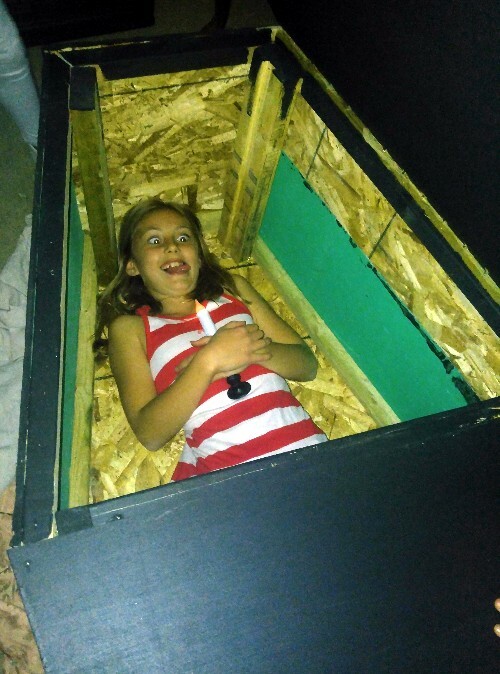 Just to add a little fun I had my son hide in the “coffin” in a full body skeleton suit and jump out at an appropriate moment and he managed to scare some of the girls half to death – lots of fun! (we did move the candle and photo first). We drank blood red (non alcoholic) cocktails and ordered Hells pizza and desert was “death by chocolate” with a chocolate fountain and all the trimmings. All in all a wonderful, memorable night and a couple of the girls said it was the best party they had ever been too. THANK YOU VERY MUCH. It was very very generous of you to share your hard work. My husband and I own a business and with 4 busy children, no matter how good my intentions, I would never have been able to put together such a plot. Thank you once again and wishing you and your family good health and happiness, love and laughter and a lifetime of dreams fulfilled. Hello, I would just like to thank you VERY much for the use of your murder mystery. We had my daughter's party this past weekend and it was a riot. The girls just LOVED it! We also had just as many parents stay and play, and I heard parents leaving saying that this was the most fun they had at a birthday party. Just wanted to say a big THANK YOU! 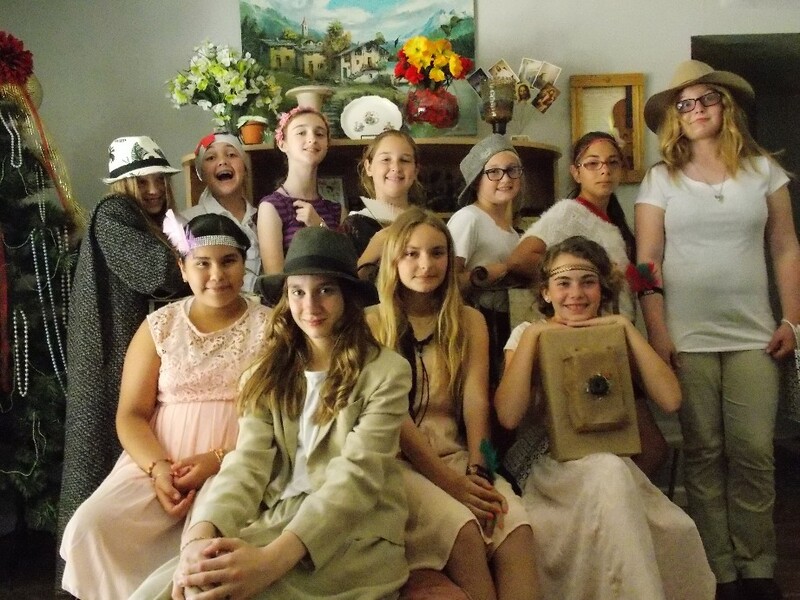 I wanted to thank you once again for sharing your murder mystery with me (all female cast of 11). 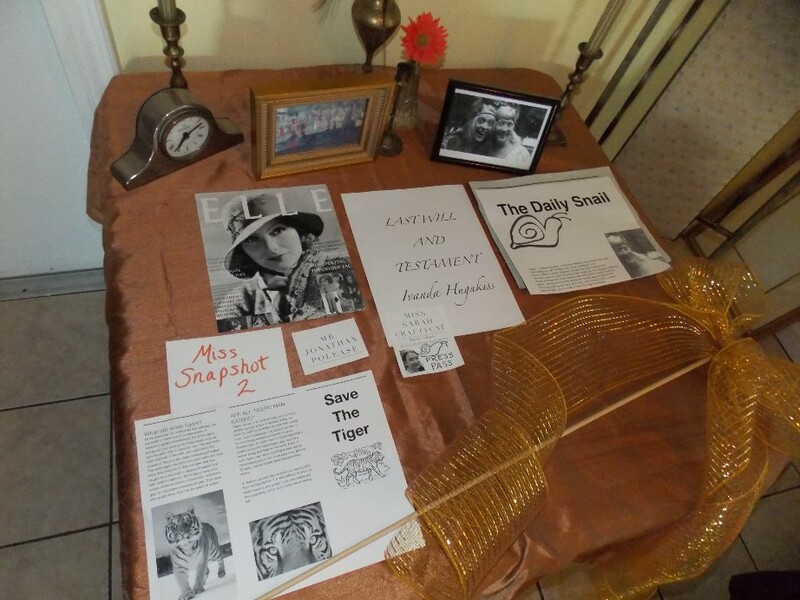 I had a great time preparing the dinner party and putting my own stamp on the characters - I rethemed it a 1920s dinner party and had each of the girls bring a prop to signify their character. That way they could all dress up in their finery. My daughter Lily got totally into character and with the help of my nephew (Jeeves), his girlfriend (society photographer) and me (housekeeper/cook) everything went swimmingly. It was amazing watching these 10 year old girls acting grown up although of course the giggles and shrill laughter got a bit much at times!! I think we definitely won party of the year and Lily knows not to expect anything quite like it again until she is 21! 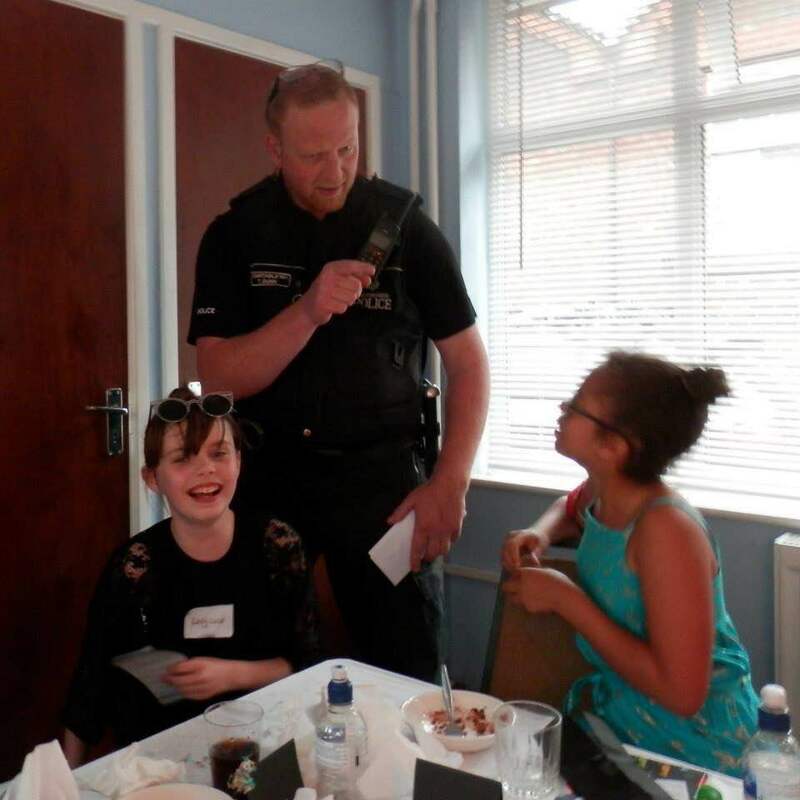 Just want to say thank you again for passing on the murder mystery, We had the party yesterday for 11 girls, it was a HUGE success, The girls thoroughly enjoyed it and were so eager to find out the murderer. They all played their part so well, especially funny was the girls reading their character secrets and finding out how horrible they were. btw, we made a good donation to the Kids Cancer Foundation. Successful party! Thanks so much!! My husband and I were wondering if you'd email us the smaller version of this dinner party? We are sure my daughter has 28 friends but would really like to do this for her birthday. Thanks. Let me add more ideas that may be helpful for other party-throwers! The review from the guests has continued to come in. As it turns out, the favorite part for the kids was how we started the party. We sent my son away an hour before the party started so that he could enter the party like all of the other guests. 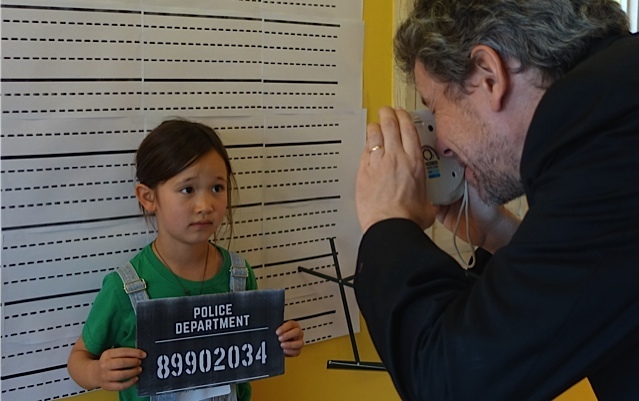 As the 10 year olds arrived, each was immediately taken from his/her parent and frisked by a detective (my teenage daughter). 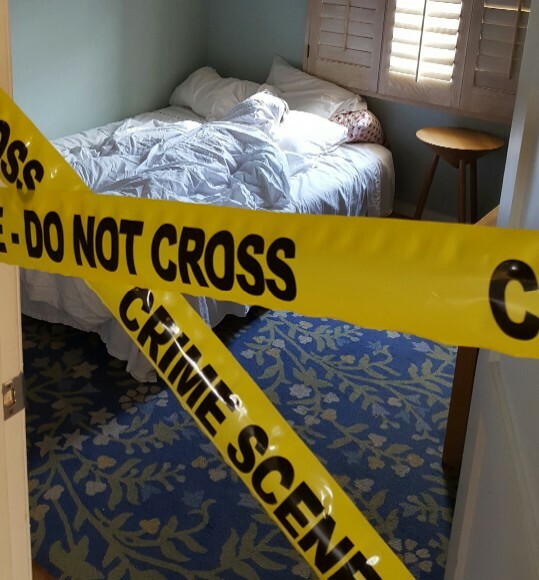 She informed them that there had been a murder and that the murderer was expected to be at the reading of the will and for security purposes she was making sure that no one was entering the premises with a murder weapon. We combined the role of the photographer and reporter and my other teenage daughter played that role. She had a real camera with flash and immediately started taking photos and asking them questions about who they were and their relationship to the deceased. In this way she was also able to help them familiarize with their character. I then rushed over as the housekeeper and apologized for the rude treatment. I tried to extract them from the assault from the press. I took them to a darkened room with a table and a candle on a table, where they picked up their name badges and character instructions. I then mixed them a cocktail (mocktail) with umbrellas, etc. and urged them to try to ignore the stressful situation and mingle with the guests until the lawyer arrived for the reading of the will. The mingling was then their time to talk with the other characters and gather clues. They were completely into it – and kept coming back for cocktails! I just wanted to give you some feedback about the short version. Depending on the age, maybe 2 hours is necessary, but we definetely had lots of fun. That was the whole point! You could also add that as a spur of the moment party, it is fun and exciting! Instead of the kids preparing in advance, I bought huge colourful glasses, fake moustaches, Hawaiian necklaces, masks and so on. The kids got into character on the spot. I also added a fake gun as a clue and added gun shots sound in a PPT that I prepared. Just to let you know the party was a huge success....I tweaked the 2 versions you sent to create an all female cast of 12....and the girls loved it! They all got into character and there was some great improvisation on the night! They are still talking about it in the playground. I cannot thank you enough for allowing me access to all of the material that you have developed. Finally, something different for kids that are used to parties that involve skating, swimming, or jumping in a bounce-house. 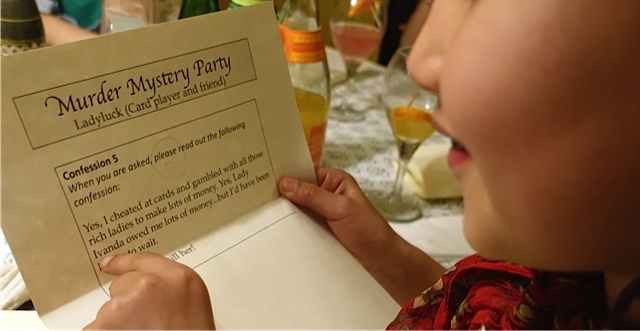 The Mystery Dinner party was a huge success and the kids (ages 7-11) had a blast with it. Since we are in the States, I only had to change/translate a few of the words around for the kids for clarity. But other than that, I kept the party like you've created. It was big fun and I've recommended it to others already. Thanks again! Here are a couple of pics from the party. One is me and my son Will, revealing the BIRTHMARK!!! Got lots of ohs and ahs on that one. And the other pic is the whole group of kids in attendance. Well, the big day was yesterday and it was a huge success. As many others have noted in your feedback section half the fun was in the anticipation; the children were acting in character at school for weeks beforehand. Some of the costumes were breathtaking in their inventiveness - Princess Estelle of Moldavia’s courtiers (parents) even announced her arrival with a royal fanfare! - and the children really gave the acting their all, even the ones without any thespian leanings. One of the things that amazed us was that every one of them spoke their lines perfectly on cue without any prompting. They really were completely immersed in the plot and in their characters! My husband adapted the script to 18 characters, which he said was quite easy once he understood the anatomy of the plot, although the modification and translation still took several days - even using Google translate for the first rough pass. He made some very minor changes to the script and there are plenty of double entendres and in jokes, especially in the characters’ names. We had a lot of fun. I enclose the results of his labours in case you should ever get another request from Sweden. Thank you so much for sharing your work so generously; we would never have even attempted this without your inspiration and the material you provided. Thank you, thank you., thank you! PS We chose to donate to the Children’s Cancer Fund. 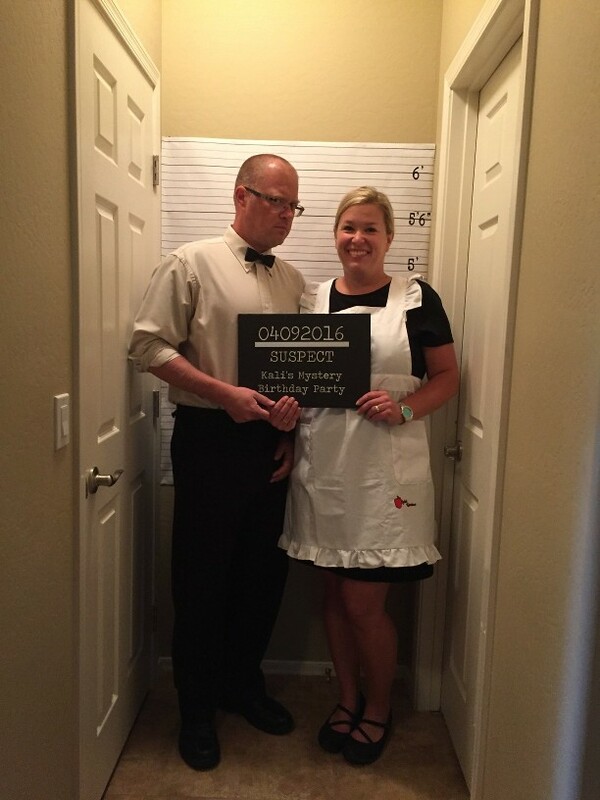 I just wanted to thank you for such a great murder mystery party! My students absolutely adored doing it and really got involved. They dressed up, put on accents and were so enthusiastic. They asked if we could do more of those because they loved it so much! I really appreciate you sending me yours. Thank you! 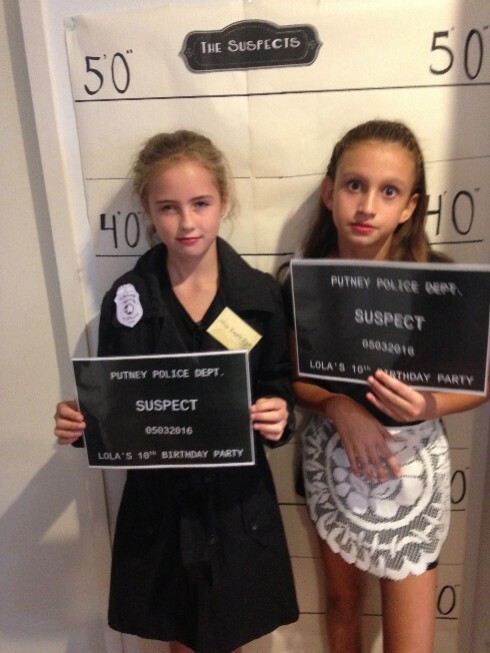 Just to let you know that we had Ella's Murder Mystery party on Sunday and it was a great success. 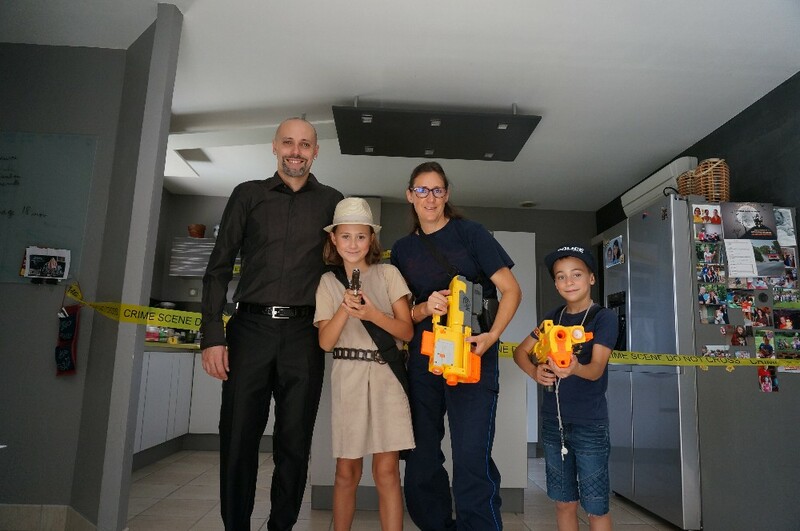 We had ten kids in all, so adapted the short-form version and they loved it, all got really excited and enthusiastic (they enjoyed arresting the murderer so much that they decided to arrest the card sharp as well). Many thanks for the invaluable materials. Several of the parents were intrigued as well, so we may have another go some time. I made a donation to Helen & Douglas House, a great local hospice for children and young people. Trevor, we had my daughter's birthday party this weekend. Your Murder Mystery Party was a success. The kids were all talking about it at school before it even happened. The kids really got into their characters. When the parents picked up their children, they all wanted to know who did it!!! It was so much fun! I appreciate your sharing this with me. It was a hit! The parents thought it was a great idea.